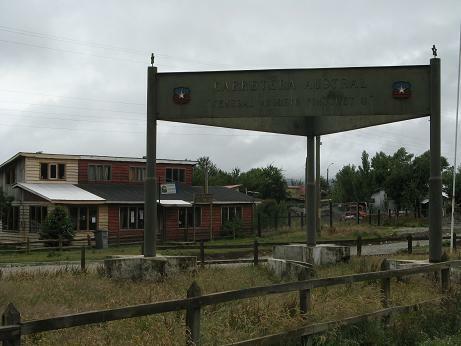 I left he internet cafe in Curarrehue, the last chilenaen town before the border, where the paved road ended. Flo and Chan waited in front of a supermarket and were chatting with people. What a surprise! It was Rosa Maria and Reto, a couple I’ve met while working at VeloPlus in Switzerland. 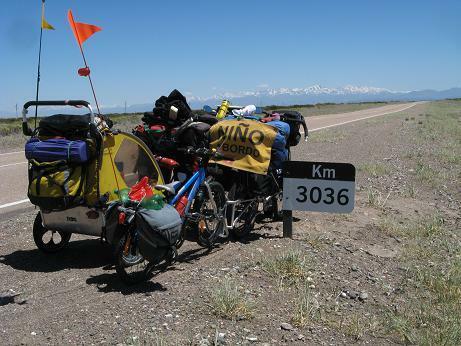 They are riding around argentinan and chilenan Patagonia as well. We spent the night together on a campsite at a river. Chan loved playing with Rosa Maria and the campground girl. Next day we started up the road to the border pass of Mamuil Malal. Rosa Maria and Reto headed in the other direction. There was road work done on this part. Gravel truck after gravel truck passed, leaving us in a dust cloud. The ground was loose, soft washboard going slightly up hill. I couldn’t ride and started to push my bike. It was crazy and I looked out for a ride. Finally a pick up stopped. 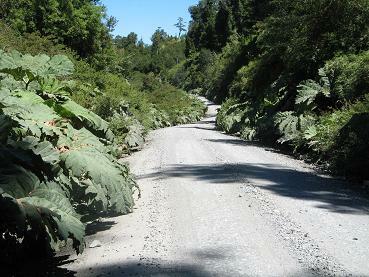 It was the boss of the road construction and he brought us to the entrance of Parque National Lanin, where the construction ended. The ride had been quite bumpy and when we put our gear back together, we discovered two missing screws on the follow me. I could still pull Chan’s bike but he couldn’t be riding it anymore, until we would find replacement for the metric screws. From here the road wasn’t as soft anymore but still “washbordy” and for the next 3km extremly steep. It took us three hours for that bit of way! We didn’t make it to the border by 3km but camped on a beautiful lake with view of vulcano Lanin. On the argentinian side we were back on pavement quickly. On our way to Junin de los Andes there was something big moving out of the pasture next to the road. Slowly it circled its way up into the sky. “Wow, that bird was huge!”, I said. Flo and I had both stopped at the side of the road and only now realized that we had just seen a Condor! 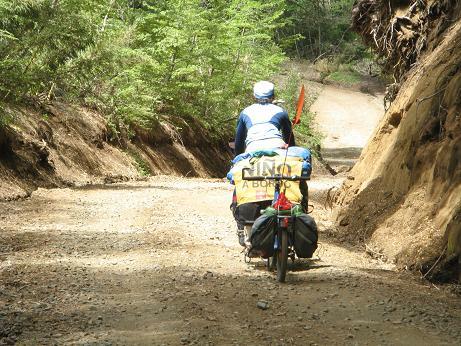 The roads beteween Junin de los Andes all the way down to Calafate are very popular with cyclists. From here we would meet bicycle tourists almost every day. In San Martin de los Andes we met Sara and Beni from Switzerland. 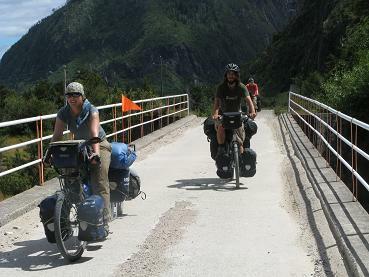 They are riding down Patagonia as well. We stayed together on a campground. Chan loved it since both, Beni and Sara, are wonderful playmates! For the next few weeks we would meet them on and off. We took the route of the siete lagos which was partially paved. It was nice warm and we stayed an extra day on a river to rest and play. But the weather changed and on the last day of gravel it rained. A screw on Flo’s lowrider broke about two kilometers before we reached pavement again and he fixed it with quick ties for now. In Villa La Angostura we had to fill up on food again. It had cooled off quite a bit and was raining hard now. We wanted to ride on to a campground but were stopped by a pick up driver:” You are riding in this weather? And you have a child? This must be really hard. I can offer you a dry and warm place and a meal. Just follow me!” After he asured us, that his house was only about 3km further and close to the highway, we finally followed him. We rode along a dirt track and after about 15minutes stopped by a huge gate. In front of us was some kind of english garden. We were led to the guest house. Now we weren’t sure if this was a hotel and the guy wanted us to take a room here, so Flo explainde to him, that we couldn’t afford this kind of hotel. But Sr. Eduardo had invited us. We were his guests. From now on the chief of his servants, Carlos, was taking care of us. After we had a nice hot shower, Carlos brought us over to the main building for a tasty meal. We went back to our room to rest a little. It was late afternoon by now. When we started to be hungry again we got our own food out, thinking that we had already been served a meal and should be eating our own now. But around 6pm a servant brought tea: milk and cereales and a fruit plate. Around 8pm they came over with pizza and tortellini and cake for desert! Sr. Eduardo came a bit later to tell us, that he would be showing us around in the morning. We spent a really comfortable night. In the morning we got our stuff ready. It wasn’t raining anymore. Carlos came to pick us up for breakfast. Sr. Eduardo came a bit later and then showed us his huge house: The walls were decorated with lots of stuffed animal heads from all over the world. On the ground was an ice bear skinn with head. There was an indoor-outdoor spa, a room for the children and a huge garden. There was a granja with deer, lamas, guanacos, peacocks, sheep, ducks, horses and donkeys. When we’ve seen everything it was already past noon. 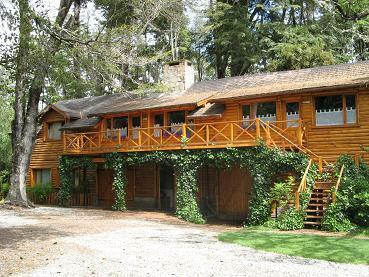 We went to the La Bolsa hostal in Bariloche, recommended to us by cyclist freinds. It was a great place to spend the holidays. There was a superb kitchen and a slide in the front yard. Chan played with almost all the backpackers and Flo was able to fix his lowrider. In Bariloche we met Randy and Nancy again, the US couple we’ve already met along the US west coast. 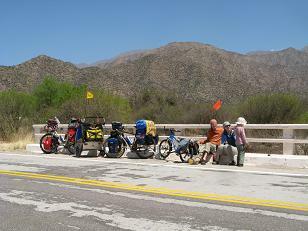 They’ve been riding the same route as we did, working on various projects along their way. With them, some of their friends and Sara and Beni we celebrated a potluck Christmas. We rode the three days to El Bolson together with Sara and Beni. In El Bolson we met other cyclists which were telling us about the bad gravel roads awaiting us at the Los Alerces Park route. We were thingking of riding around the park and enjoy pavement for a few more kilometers, but that would have meant to go back into the pampa and carrying water for two to three days. The gravel road wasn’t all that bad. Anyways, we have had worse. The park was beautiful and we were glad not to have skipped it. We celebrated new years on lago Rivadavia. Towards the end of the park Flo’s old aluminum lowrider fell apart. He fixed it again with quick ties. But in Trevelin we took another day off riding. There he had a new lowrider made by a “everything” welder, one like mine. 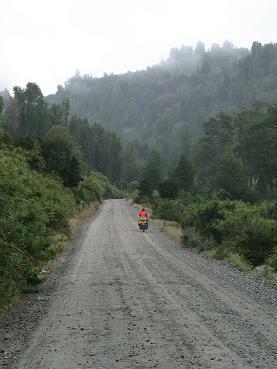 We were now really close to the careterra austral, of which all cyclists are crazy about and from here there would be only a short part of pavement around Coyhaique of about 150km the rest dirt or gravel. 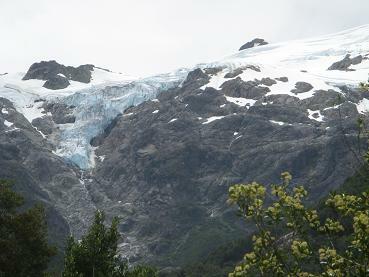 Another border crossing back into Chile brought us to Futaleufu. Here we wanted to fill up on food for a few days. But if there was fresh food, it was rotting on the shelves, the supermarkets were only half full. We ran into Sara and Beni again and camped together another night. That late afternoon it started to drizzle. Luckily Beni had mounted a tarp which kept us dry while cooking dinner. But when I wanted to prepare our tent for the night, it was wet inside. The seam sealing we had applied to it in Villarica didn’t work, or it was leaking somewhere else. 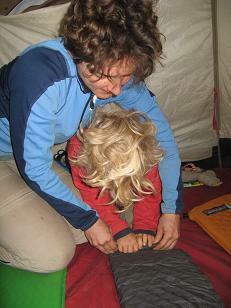 We were thinking hard to find a solution and finally Flo constructed a rain coat for our tent with another tarp! It worked, we stayed dry! The gravel, dirt road was in parts quite bad but mostly ok. to ride on. Our surroundings made up for the bad parts. 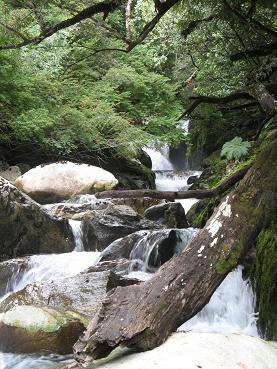 We passed streams, rivers, waterfalls, snow peaks, glaciers, nice smelling pastures and forests. 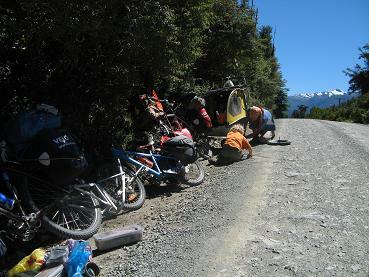 Shortly before we reached the careterra austral, a part of my lowrider broke off. Luckily we had bought a bunch of quick ties in Futaleufu! And then, there it was, that road that is a dream of so many cyclists! The first two days on the careterra the sun smiled at us. Here as well, the gravel was mostly ok. to ride on until we reached the long parts of road construction. Then we could only make around 30km a day. But every night we found a cosy spot to put up our tent close to a little stream where we would wash off our sweat and Chan could play. 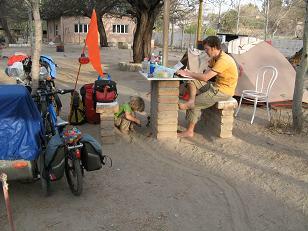 On our second night on the careterra, altough the sky had been completely blue when we went to bed, the rains started. Flo got up in the middle of the night to put the “raincoat” around the tent. The morning was grey. It wasn’t far to La Junta. We stopped at the gas station where they were just building the roof. They had welding tools right there, so we asked, if they could fix my lowrider. One of the workers took it, cut off a tiny piece of the gas station and fixed my lowrider with it! The drizzle stopped and we had lunch at the gas station, bought a few things and jolted on. Over the next few days we had to put on more and more layers. It had cooled off a lot. 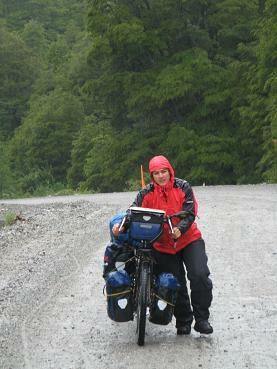 It was also raining on and off every day, so that we got into and peeled out of our rain gear several times a day. We woke up to rain again. Inside the tent it stayed dry, but outside everything was dripping and so were we, as soon as we got outside. 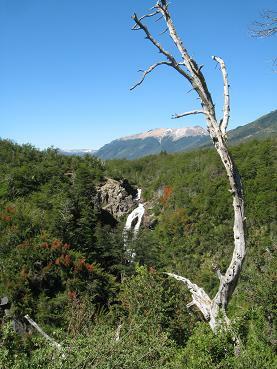 Just as we started to climb a 500m pass in Parque National, Quelat, a Rotel passed us. That’s a hotel on wheels. It was a truck like bus which pulled a wagon with night compartments. Around 15 people between 45 and 65 got out to see a waterfall. They stood in a row along the road as we passed and klick, klick, klick, went their cameras. The 17 switch backs we had to push our bikes up and Chan was walking, jumping and running, throwing rocks into the streams. Then we still hadn’t reached the pass altough we passed the sign of the pass. Only a few kilometers further up we had made it. It was freezing, because we were wet inside from the sweat and outside from the rain. Flo put up the tarp and we ate lunch under it and changed into dry clothes. Downhill it was very steep, on a bad soft and rocky road. But once at the intersection to Puerto Cisnes the rain had stopped and we even got a glimpse of the sun. We discovered, that another screw on my lowrider broke off and like so many times before, Flo fixed it with quick ties. We only rode 5 more km, then we stopped at a stream to fill up our water bottles. We were all quite tired from the pass and decided to stay right there under the bridge for the rest of the day and the night. It was a good spot. Chan was playing with the water and we had hung up all our wet clothes and got the broken screw replaced with a new one. 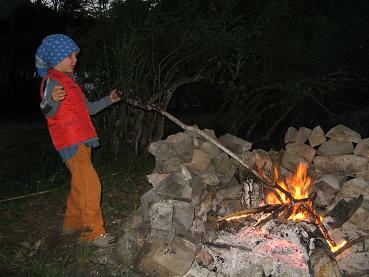 Then we cooked hot chocolate and were happy to be all dry since it rained quite hard again. There was a small pool in the stream where we washed off sweat and dirt before going to bed. It rained all night quite hard. When I got up in the late morning, the pool was gone and so were the rocks on which Flo had crossed the stream last night. Our little stream had grown into a river over night! We packed up everything and by the time we were ready to ride on the road, the rain had stopped again. For the first 10km we could ride nice and dry, but then the rain clouds chasing across the sky cought up with us. Bundled up in all our rain gear we made it to pavement again. We reached Villa Amengual mid afternoon and warmed up in a cafe. Then we looked for a hospedaje had a nice hot shower and stayed dry again, while it was raining outside. Now on pavement we could ride 60km a day again. The weather stayed the same so that we changed in and out of our rain gear many times. 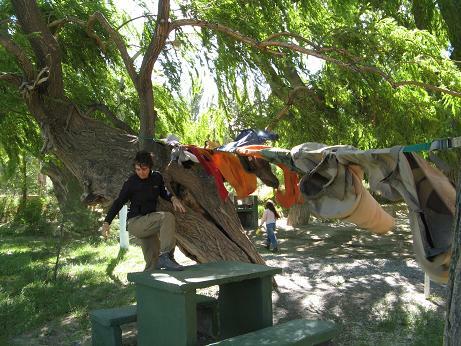 In Villa Mañihuales we found a forestry service campground with little huts and we put up our tent in shelter. The daughter of the ranger had just made a raspberry pie and brought us three pieces over. Next morning Chan was sick and had to throw up a few times. Along the way he had to shout out of the trailer a few times. We stopped got him out and he was throwing up at the roadside. 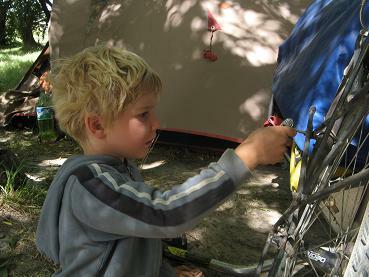 After another 60km we found another campground with sheltered tent spaces. Chan’s belly sickness had by now turned into diarrhea. He went through all his underpants quite quickly. 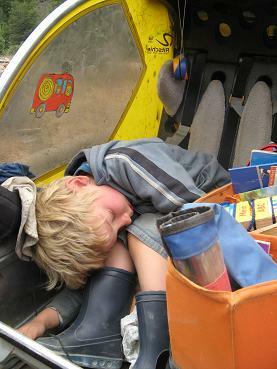 Next morning he seemed to be better and we rode the 35km to Coyhaique. That’s the biggest city on the careterra austral. Here we have to get parts of our equipment fixed and a lot more to do while resting to get ready for the second part of the much less populated leg of the careterra austral on ripio! Strenghtend by the many ice creams we rolled out of Mendoza. For the next 100km our surroundings were green cultivated fields, irrigated with the water from the close mountians. 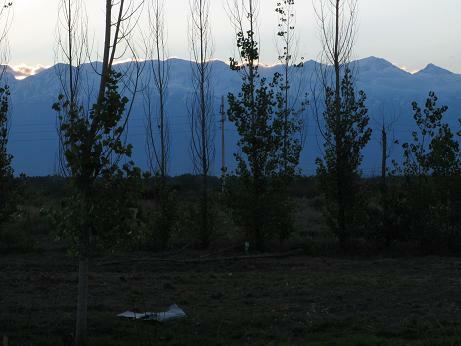 The second day we admired the snow capped mountains at sunset for once cloudless. We camped at gas stations and needen’t worry about water. But then we decided to take the paved road to San Rafael instead of a dirt road with unknown condition and soon there was no more green, just brown bush desert around us. The wind was nice to us that day and we travelled 100km and just outside of San Rafael reached a shady roundabout with poplar trees and camping tables. Again we found cultivated land around us, but as soon as we climbed out of the river valley the vegetation diminished, left were only brown bushes. 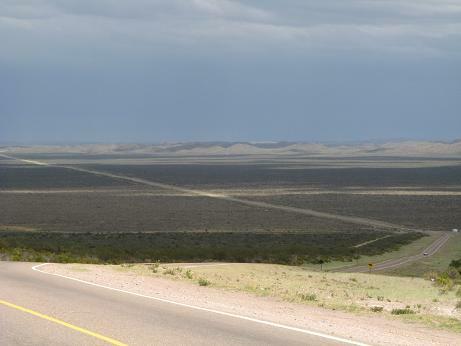 We reached a pass and looked down onto flat pampa, mountains on the horizon and the wind chasing black clouds across the sky, bringing rain, hail and thunderstorms. Not again! 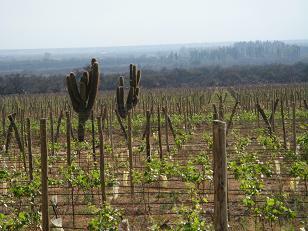 Didin’t we have enough of this on the Altiplano already? The same old panick crept upon me. Flo was looking out for some shelter. Of course there was none. We kept pedaling as usual, what else could we do? And we were lucky. The clouds hailing onto us passed quickly. Lightening stayed far away and soon the sun smiled at us again. Then an intersection with a store turned up where we warmed up with a cup of coffee and put up our tent for the night. 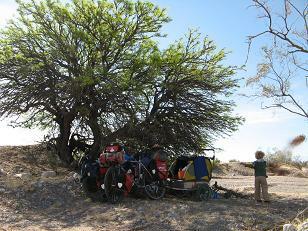 We reached Malargue on the sixth day after we had left Mendoza and stayed on a campground for three nights. What was lying before us now wasn’t easy riding anymore. We came through beautiful landscape when entering the foothills of the Andes. 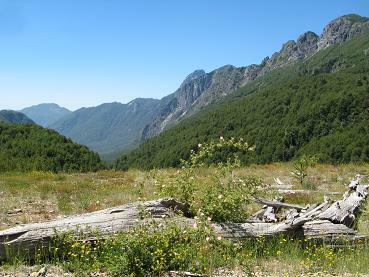 Whenever we climbed up over a pass we hoped to see more vegetation in the next valley. We searched through the thornbushes with our eyes and pointed out every green spot or new plant we made out to each other. But in reality we just entered a new valley of bush pampa. Altough some of the streams actually carried some humidity, most were still dry and dusty. My new lowrider past the test of a longer piece of dirt road, where we ran out of water and went to bed with dry mouths only to discover next morning that we should have gone on for two more kilometers uphill. On the other side of that slope was a beautiful small lake. 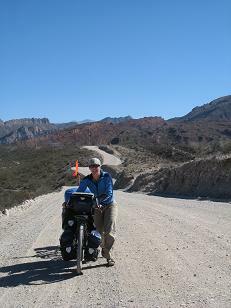 Back on smooth pavement we crossed the boundery into Neuquen, the most northern province of Patagonia. 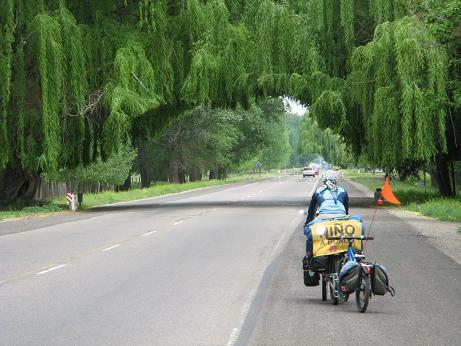 Still there was no more green in sight than the tall poplar trees in the towns, but we were greeted by the strongest wind so far, that first day of riding in Patagonia. We flew uphill with a speed of 15km/h without even pedaling. The wind was shaking our bikes and pushing us around. Then, after 38km rollercoaster, the road turned and we stood still. We had just begun to climb a pass and now needed to push one bike at a time uphill meter by meter. Somethimes we couldn’t move even when both of us were pushing as hard as we could. We needed two hours for a bit more than a kilometer. So this was the wind, people were always talking about. Luckily Lalo came to rescue us with his pickup. Just a few kilometers before he found us fighting against the wind, his windshield had been damaged by small stones the wind was spinning through the air. He cut our path and ordered us to accept his ride to the next town, Chos Malal, 50km further. It was too dangerous to continue by bike. I had already been wondering how we could possibly put up our tent in this storm with no sheltered space far and wide. The wind storm continued the next day. We were glad to be in town, where it wasn’t quite as strong. Our laundry was dry 10 minutes after we had hung it up though. Trees and rivers, flowers and beautiful scents at last! From Chos Malal it was two and a half days to Las Lajas. Some of the streams we crossed were now running. 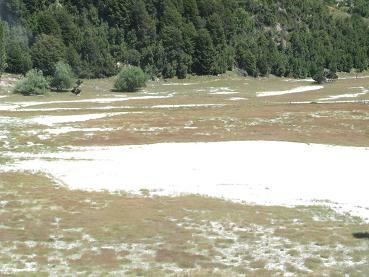 But we didn’t believe it anymore that the vegetation should be changing into lush green within the next days. Around us was the same brown pampa, no sight of change. 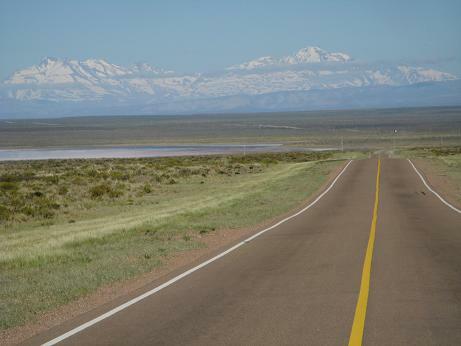 Only when around a bend the snow capped Andes appeared we got hope again. Las Lajas was green only because of the planted poplars, but for the first time we could make out trees on the mountain slopes and for the first time we put our tent up on grass. 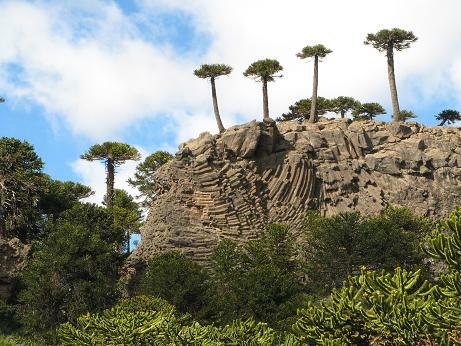 Halfway up Paso Pino Hachado it was suddenly there, a group of araucaria trees. Finally! More and more of those funny trees appeared. We were amazed by the beauty of nature that was now all around us. 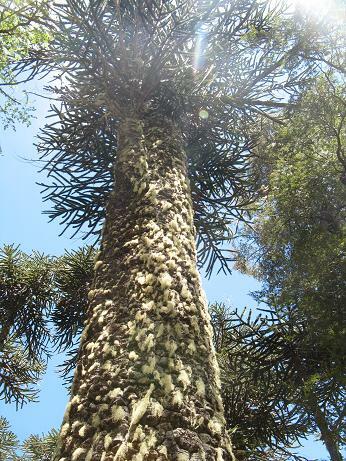 We slept under an araucaria that night. Next morning the wind was back. Slowly we made our way uphill towards the frontier with Chile. We passed customs quickly, but stayed in the building to eat lunch sheltered from the wind. The next seven kilometers up to the pass were on dirt and very hard. The patagonian wind really wanted to keep us. On the other side of the pass it was even greener. There were little streams running everywhere. 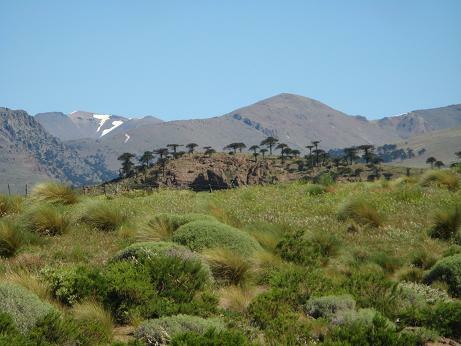 The diversity of the vegetation was growing with every meter lost on altitude. it wasn’t easy to ride down that pass. The wind was still pushing us around. Somethimes we had to pedal hard to move foreward, downhill!! 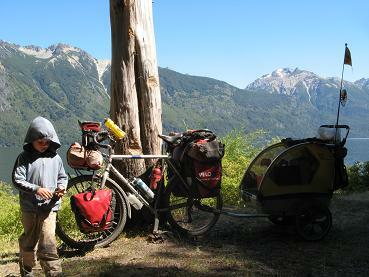 Chilean customs wasn’t a problem either, since we had nothing to eat in our panniers anymore. After all that wind and dust of the past months we now needed to take a break at a nice spot. We found one at Suizandina, a hostel and campground built by a swiss guy who was once riding his bike from Vancouver to tierra del fuego! Chan had a blast with five other kids while Flo and I enjoyed a rich swiss breakfast buffet and a lawn to hang around. After 10km on the road that morning other cyclists were aproaching. Wasn’t this a kids trailer? We stopped for a chat and this chat turned out to last five hours. 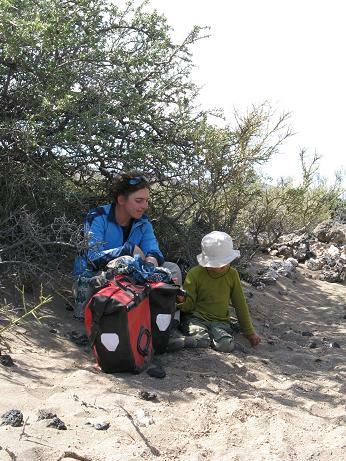 Christiane und Patrick are travelling with thier two and a half year old Max for half a year in Chile. 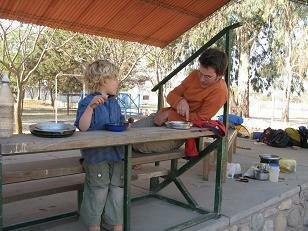 After a while the two boys started to play together and we were exchanging travel stories and experiences. 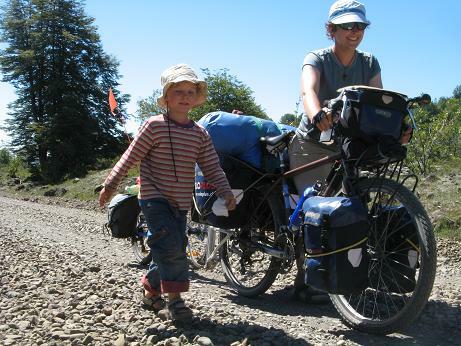 This was the first cycling family we have met in those 7 years since we had left Switzerland. In Curacautin we filled our panniers with food and snacks because we wanted to cross Parque National Conguillio at the still active vulcano Llaima (3125m). For two days we were climbing up on a very bad and soft gravel path. The second day was worse. We only made it 10km far. Poor Chan had to walk most of it. 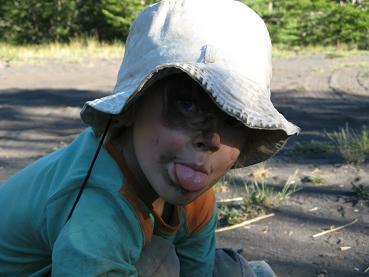 Flo couldn’t pull the trailer with him in it trough that soft volcanic ground. When we finally reached more forested areas, the road was better but leading up and down incredible steep slopes so that we still couldn’t move quicker. Our surroundings were beautiful, the views of the volcano stunning, but we would never recommend that route to cyclists with weight on their bikes. Even Eric, an american cyclist which we met up on a mountian lake, where we camped, needed one whole day for 40km, when usually biking 120km. Back on pavement we wanted to stay on it, even if that meant a detour of about 100km. So we pedalled to Temuco and then a part on the autopista. But it was fun. 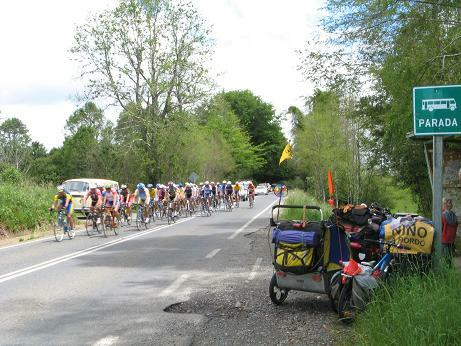 There was a national bike race taking place on our route. Aparently there were 300 cyclists starting within different categories. First they rode in the opposite direction, then they turned and passed us, some of them waving and cheering at us. Just behind the last racer we crossed the finish line cheered by bikers and their coaches. In Villarica we wanted to stay for a few days and celebrate my birthday. We stayed in another swiss hostel with Claudia and Beat who were cycling once around the globe as well. The night before my birthday though, I got the message, that my Grandma had died. Having lost already two of my grandparents on our journey I strongly felt that I had to go home to be with my family this time. So I managed to find a more or less cheap flight, got a bus ticket and was off to Switzerland, where I just made it to the funeral. I stayed three days. Then I had to go aboard another plane again to be back with Flo and Chan for Chan’s birthday. 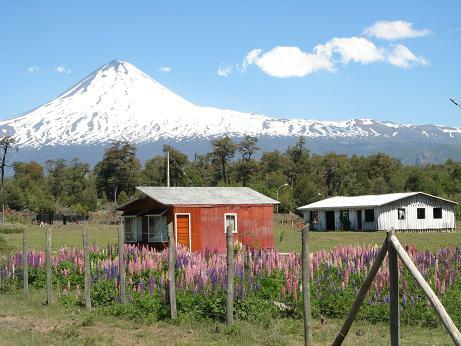 Meanwhile the two stayed at a friend’s blueberry farm near Villarica. Chan was busy playing with Marvin a boy he had already met at the Suizandina hostel a week before. Flo was helping out with all the kids on the farm (Marvin’s two sisters and two more boys visiting) and did some gardening work. On the sixt of December we celebrated Chan’s birthday with Gritibaenze (breadmen) and a chocolate raspberry cake and Chan and Marvin had Chan’s presents unwrapped within about five seconds. We are still at the blueberry farm. The people here are already saying, that we will probably stay until April for the picking. But we are ready now to once more hit the road. 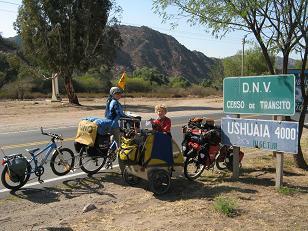 In a day or two we will be riding towards Argentina, then heading south again. I wrote that update two days ago. Then the computer couldn’t handle the pictures and I couldn’t finish the upddate. TOday we left the blueberryfarm. 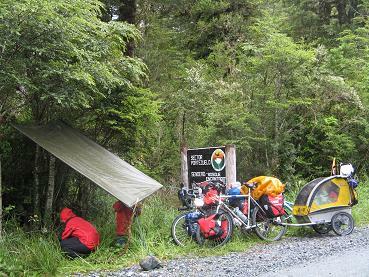 When we hit pavement after six kilometers, I heard a bad sound: The part, where the backrack is attached to the bikes frame was broken again (like once before in Mexico and the other side in Ecuador). 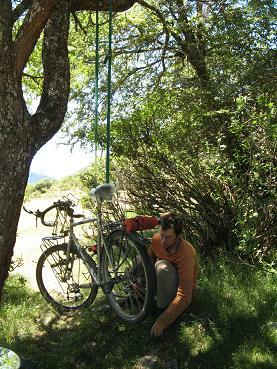 We fixed it with some straps and rode on to Villarica, where we welded the frame just an hour ago. 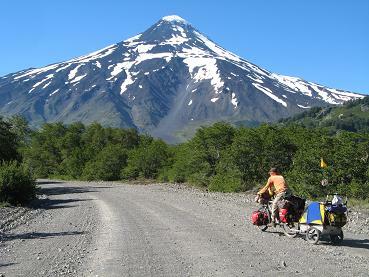 Tomorrow we will definately ride on, the Carretera Austral as our next aim. 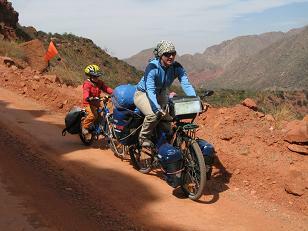 The Marin family from the casa de ciclista in Salta had been incredible. We could stay as long as we wanted to prepare for the continuation of our journey. 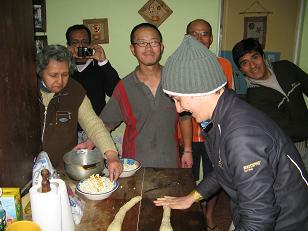 The only thing we could do in return, was cooking for them in turn with the two japanese ciclists who were staying there as well. But for me it was necessary to leave, as soon as we got my back wheel from Switzerland. I had asthma from the many animals and was coughing, sneezing and catching my breath all day long. Even a few weeks after we had left, I would still get asthma attacks when ever we had a minor uphill or some head wind. The first day we only made it 40km far. Then our legs needed to rest. We camped at a complejo municipal with a swimming pool, though the pool was empty for it is spring and the air can still be quite fresh. For a while we made about 50km per day. This was enough to make some distance, but in a way that we enjoyed the ride and didn’t bike more than a few hours. We had enough time to take breaks and give Chan time to explore and play. In Cafayate we took a day off to hang out and eat helados. These first weeks we needed to give our bodies many breaks. That good shape we had from the altiplano and all those incredible passes in Peru half a year ago had disappeared and we are feeling our legs even after a short day of biking. Past Cafayate the wind started to blow. It was either head- or sidewind or it started out as tailwind and slowly turned into headwind. 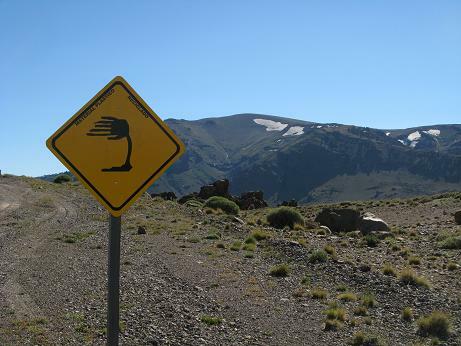 Weren’ t other cyclists telling us the winds start in Patagonia? 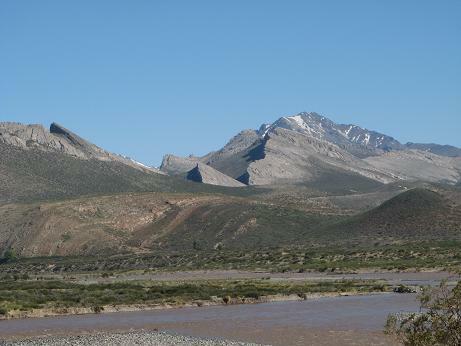 Anyway, the argentinians are telling us now, that on Routa 40 the wind starts blowing from Mendoza northwards in the month of october! 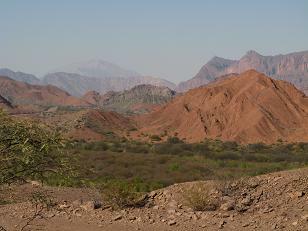 The flowers on the roadside, the trees, grass and wineyards disappeared shortly past Cafayate and we entered desert and thorn land. Chan loved it and got his cars out as soon as we stopped for the night. With sticks and rocks he drew roads into the sand and soon was covered with dust. From now on we had sand and dust on and in everything. Somethimes the wind didn’t slow down at night and our dinner was enriched with crunchy sand kernels. It wasn’t easy to find spots sheltered from the sun and wind and many times we put up our tent quickly under a thorny bush and fled inside as soon as it was up to get out of the wind or away from mosquitos. Luckily our tent is storm proof and stands up to the blows like a rock. Poor Florian always needs a warm dinner and so he went outside into the dust storms again a few times to cook some pasta. We were moving quite fast, the road was straight and flat. Ups, what’s this? No more pavement! 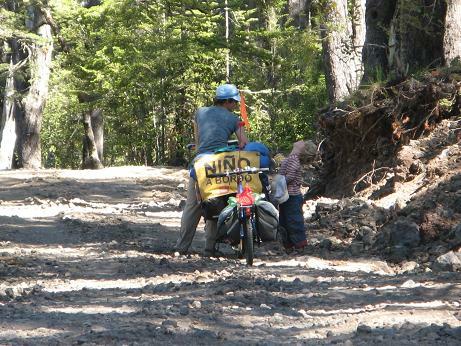 Our first “ripio road” was pretty sandy and soft and had a nasty washboard surface. We slowed down very much. I wasn’t prepared for it although I knew it was coming. I got into a grumpy mood. How did we manage to ride all those dirt roads in Peru and Bolivia? I just wanted to get back onto nice and smooth pavement again! Flo lost a screw on his front rack, but after about 40km we rolled onto pavement again all in one piece. Not so on our second dirt road a few days later. The surface was better, much harder than on the first piece. We weren’t faster though because the road was going uphill, in parts steeply. On the last few kilometers, where the road was flat again, I suddenly lost one pannier and one of my lowriders entangled in the spokes. Flo got it straigt again, but after a few 100 meters, it broke completely. It is a good thing, that I have a front rack as well, on which we now put my panniers and I had to ride the last few 100 km with my panniers high up. The lowriders, I can’t use anymore, we will have to get new ones done. I don’t want to go to Africa! Chan enjoys travelling again and he is indeed very content. The trailer is a bit small now, but we changed the interior, so he’s got a bit more space. 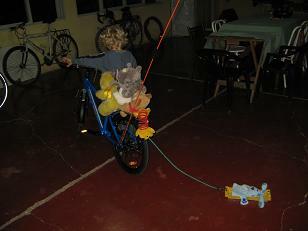 The first few days he ignored his new bike and said, he would only be riding it, once he was five. But suddenly one day he wanted to get on it. He was first putting his feet high up onto the frame, not using his pedales and Flo wasn’t allowed to take a picture. But then he started to use his pedales, first very cautiously. Next time on his bike he was pedaling for 10km, playing to be a fast train’s driver. One night I asked him how he is liking to be travelling again. “It is good, I’m happy. But are we on our big journey again?”, he answered. “Yes.”, I said. “Ah, show me on the map, where we are going to next. And when we are finished in this country, we are going to New Zealand, right?” So I explained, that we are thinking of going to New Zealand, or maybe Africa. “No mama! I don’t want to go to Africa! There are tigers and lions and they want to eat us!” Since then he is always asking if we were in Africa yet, and if there were any tigers around, before getting out of his trailer. Somethimes he wants to get back into the trailer from his bike, because he saw the shadow of a tiger or a dragon in the bush. 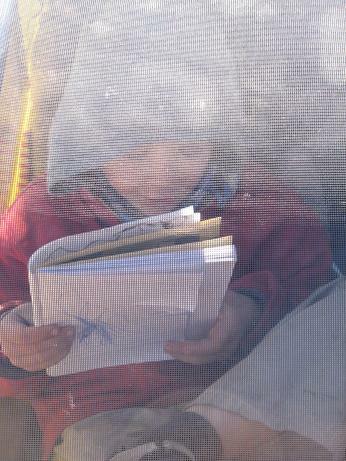 In the trailer he is drawing lots of maps with roads we already travelled on or will be taking. The day before we left Salta, I was wondering, how it would be back on the road, not knowing where we would spend the night, discovering new terrain day after day. The first few kilometers on the bike felt a bit unbalanced, but already outside of the city it was just normal again, the bike is almost a part of my body! Flo and I have been riding our bikes for over 35’000km now, so they are pretty much a part of ourselves. Chan has been riding with us for about 20’000km! Most of those first 1300km we have travelled now were through dry desert land though, and we’ve seen quite some land like this by now. 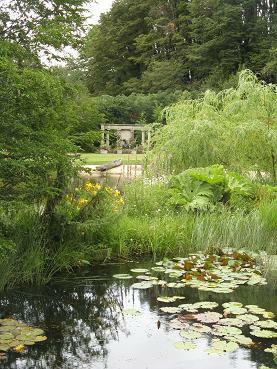 We are looking foreward to greener landscapes, trees, shade, grass and rivers or lakes to play in. Another 1000km and we won’t need to transport 10 to 15 liters of water per day anymore. While Flo and I are counting the kilometers until we reach more fertile land, Chan is counting the days until his birthday. We made a calendar and every night he makes a cross and talks about the presents he will get. And since my birthday is a bit before his, he offered me to help unwrap my presents. 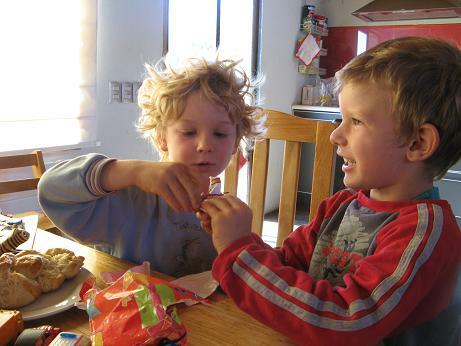 In Mendoza now, we are preparing for our two birthdays eating up pies and ice cream in advance. Saturday august 30th was my last day at work. Flo and Chan came to the VeloPlus store and we bought our last parts of equipment. Every day of the coming week was planned out with packing, storing some of our belongings with different family members, good bye dinners and my sister’s wedding. Two das of that week we also gave slide presentations at the EuroBike, the biggest bike exhibition of Europe, at the stand of our trailer’s company. Monday September 8th we got up at 6am. We got a ride to the train station and started our 3 days journey back to Argentina. We checked in our baggage at the airport and then went to my mother’s place for luch, where all of my family came togehter to say good bye. 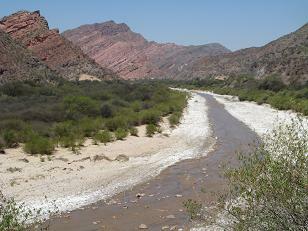 Our flight was at 5pm that afternoon and now we were moving towards Salta for the next 50 hours by plane and bus. When we left Argentina 8 months ago, it felt so close to Europe, so much better off than Peru or Bolivia. Arriving at the airport of Buenos Aires, nothing at all resembled Europe, even less at the bus terminal with all the garbage lying around, the luggage carriers competiting for customers and the small stalls with plastic toys, chips and cola. Out of the bus window we looked into barren winter landscape. Everything was brown. Only here and there gave the light green spring leaves some colour and the further north we came, the more trees were blooming in purple, orange, yellow and red. At the outskirts of Rosario, a city 200- 300km north of Buenos Aires, I shuddered, when realizing, that people really lived in those tin- and cartboard houses, some of them even only built with dirty cloths, right on top of the city dump. Small smokey fires burnt here and there and children and dogs were searching through the garbage, looking for something usable. Chan travelled very well. He slept most of the flight and the bus ride. If awake, he was content watching children’s movies or playing with his new cars. It was nice warm, when we stepped out of the bus in Salta, but the next day was cloudy and it cooled down since. Now we are wearing three layers and I even got my woolen cap out. All our cartboard boxes we brought here are empty, our new panniers packed and ready to go. Chan’s bike is put together, the new axel is installed on the trailer. Flo’s bike got his front wheel and bottom bracket replaced and we would all be ready to start cycling again, if not for my back wheel. When taking out the rim tape, to replace it, I discoverd cracks in the rim, we didn’t noteice, when preparing our bikes for storage 8 months ago. There are no Mavic or Sunrims here in Argentina. So we decided to call VeloPlus and ask them to send us a back wheel. 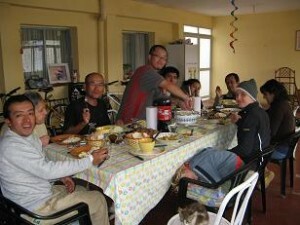 For this we are now waiting here in the casa de ciclista of the Marin family in Salta. I haven’t been writing an update for a long time. Things have been happening fast here and there is always changes. Florian started to work 3 days after we arrived at my sister’s place. He was thrown right into working life and didn’t have time to think, while I was home with Chan and had to figure out what to do. Should I organize slide shows or work as well? I realized quickly, that I wouldn’t be able to organize a professional show with musik and what else. There is just not enough time for preparation and promotion in half a year. So I was looking for work as well, and found a 60% job in a store that sells everything around bicycles. Now, what should Chan be doing? I finally found a space for him in a forest play group, where he was going once a week for a morning. It was really hard to find a space in a daycare, but finally, right before the start of my job we found a montessori daycare who was going to have space. But when we wanted to sign a contract, the owner wasn’t happy with Chan going there for only five months anymore and suddenly she had a problem with him only going for two days per week. We had to organize our families to look after Chan for the first month I was working. Somethimes switching from Winterthur to Basel for a night. Then we also had to move out of my sisters place. She had found a new place with her boyfriend, where we had no space anymore. 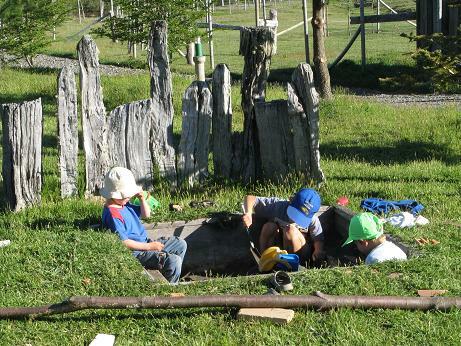 Friends of ours asked around for us as well and that’s how we came to live in Rüti, close to my workplace, with Anet, Hansi, Lorenzo, eight, and Benjamin, two, who are like brothers for Chan. They were living in an old farmhouse on the outskirts of a small town. It was paradise for Chan and for us. I found a pre-kindergarden five minutes away from my workplace. The owner there is half peruvian. She is speaking spanish with Chan and he is enjoying two and a half days of learning and playing with other kids, though sometimes he doesn’t want to go and asks when we will be leaving again. Again we had to move. The family we are still living with bought a house in the same town. A farmer came with his traktor and heywagon and all the furniture was moved with two loads. Cleaning was taking two three days and still isn’t completely finished. The new house is even bigger and closer to the train station. This gives us a bit more time in the morning. 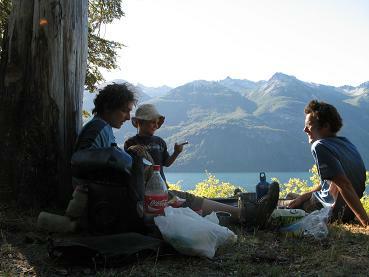 Soon Chan will go to the mountains on holyday with his grandfather and cousin. My oldest sister will give birth to her first child in August where I will be her Doula and my second sister will have her wedding a few days before we leave. We did give two digital slide shows and both times had around 60 people watching. With the donations we could buy much needed equipment for our further journey. We wanted to get up early to be able to bike at least for the first little while in cooler temperatures. But as it turns out so often, we didn’t make it out of the campground before 9 o’clock. The sun was intense though not too hot. 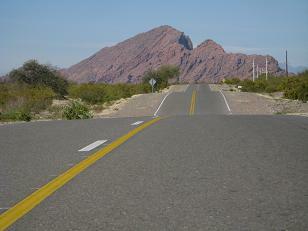 The road led straight towards the mountains with no curve. From San Pedro de Atacama we now had to climb 2400 meters up to the first of four over 4500m passes and this within only 40km. The first 10km were flat and then it got steep. After 20km I was exhausted. We took break after break, but by km 25 I couldn’t ride anymore. I had to push my bike which was loaded down with food for six days. Luckily some people we had met on the campground were brining most of our water to kilometer post 30 for us, so we only carried about 10 liters of the 40 liters water we had to bring on that lonely 300km stretch of road lying ahead of us. 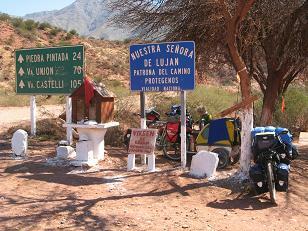 After 160km, at the border to Argentina, we would be able to fill up on water again. But we needed three or four days to get there, over another 4800, 4700 and 4300m meter pass through the driest place in the world, the Atacama Desert. The only water up in this vulcanic area is salt water. We barely made it to kilometer post 30. We needed an hour for the last two kilometers! Chan was walking, somethimes helping me to push my bike. Flo came back for me now and then to take my bike for a few hundred kilometers, so that I could rest my arms a bit. When we had made it to our water, we first needed to sit down and rest. We were watching cars and trucks go by effortlessly. 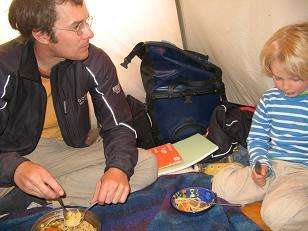 Finally we cooked spaghetti, put up our tent and went to bed. It was getting cold up there, close to 4000m. It was New Year’s eve, but we saved our bottle of red chilenian wine for another night. The wind gained on strength throughout the night and in the morning it blew into our faces. Now we had to carry our water ourselves, so the bikes were even heavier than the day before! The road was still incredibly steep and the wind didn’t want to settle down. I started to push my bike. Flo was as usual riding. The wind almost brushed me from the road. My legs and arms were hurting from the day before. I was tired. But Flo kept on going. I couldn’t push my bike beyond the first kilometer. This was going nowhere. 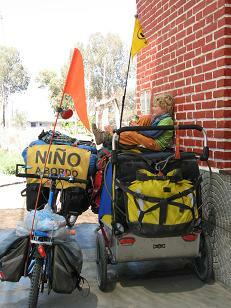 We needed to bike at least 40km a day for our water supply to last until we would reach the border. We had only made 30km the day before and I was exhausted after only one kilometer this morning. 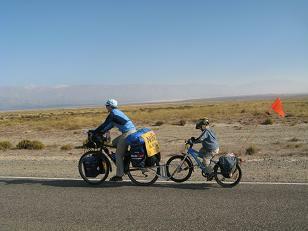 The pass was after some 40km from San Pedro de Atacama, that meant at least 10km more to climb. I couldn’t do it. I yelled at Flo to wait for me. I wanted to get a lift up to the first pass. Flo wanted to ride. We were in a pretty bad mood for quite a while. Finally I got a ride for me and Chan and all our luggage but Flo had to ride his empty bike. So we both got what we wanted! Chan and I were dropped off just a few hundred meters below the pass, where we waited for Flo. Even without the weight of the panniers it took him over an hour for those 10km. I was glad I didn’t ride. From here the wind lost some of its strenght and the road curved its way up and down through vulcanic desert landscape on much gentler grades. We made it 50km further. On the other side of the mountains we had had the most beautiful warm and sunny weather without any clouds in sight, up here though, back on the southern end of the altiplano, the clouds were back, but we didn’t get rained on yet. When we had made it up the last 4800m pass before the Argentinian border it felt really good! Finally I started to see the end of those months riding through deserts, dust, sand and salt, grey, brown and white colours. 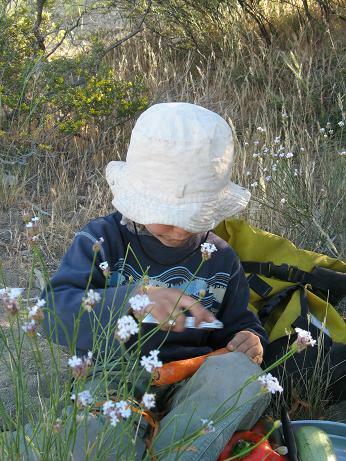 A different climat was waiting for us, soon we would be whizzing down into a green, fragrant argentine summer. 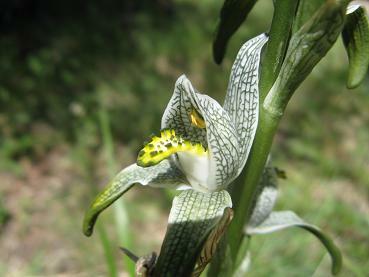 I longed for trees and flowers, some grass, some life. Rolling down that pass somehow promised more than just another uphill through desolate landscape. 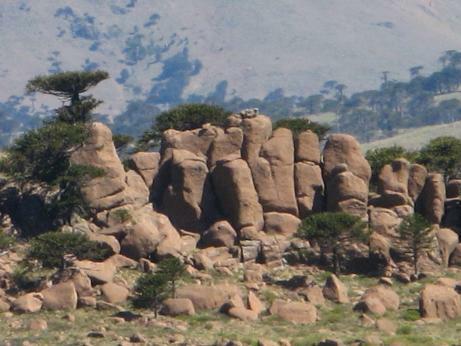 Even the rocks on this downhill were different, they were sticking out of the sandy ground vertically, shaped by wind and weather into oddly looking figures. We stopped to fix a flat. Flo looked up to the pass we had just left and said:” It loods like some rain up there!” and for sure black clouds were wrapping around the peaks in our backs. Before us was an another salt lake and barren landscape as far as we could see. No trees or bushes not even big rocks to look for shelter. So we kept riding and the clouds came closer, thunder begann its growling tune and the first lightenings made me feel extremely uncomfortable on my bike. There was nowhere to go. Finally Flo exclaimed that the most secure move for us would be pitching our tent at the foot of that hill we had just reached now. Thunderstorms were now in front of us as well, actually all around and any of them could catch us at any moment. Chan waited in his trailer while Flo and I put up the tent in record time. Then I unpacked the bikes and carried our stuff to the tent, while Flo parked and locked our bikes a few hundrerd meters away from us. I went inside to roll out our thermarest matresses and to distract Chan from the thunders. Flo installed the stormstrings because the wind had picked up now, then he came inside as well and in the same moment the rain and hail lashed down onto our fragile home. We needed something for dinner. I suggested bread and olives. I didn’t want to get outside anymore. But Flo said he needed spaghetti. So he went out in a calmer moment and turned on the stove. But as soon as it was running the wind picked up again and with it the rain as well. It took him probably five tries until he could finish cooking. It was nice to get something warm into our stomachs. The world around us was white the next morning. We could still see the clouds on the horizon but above our heads the sky was blueish. We followed the road up onto a plateau from where we enjoyed beautiful views onto freshly snowed on peaks above 6000m. The wind wasn’t too strong yet and we made it to the border before noon. it was almost shocking to see so many people there after the isolation of the past three days. Chan and I waited outside, watching the many tourist groups from adventure jeep trecks and tour buses. Flo waited in line to get our passports stamped. 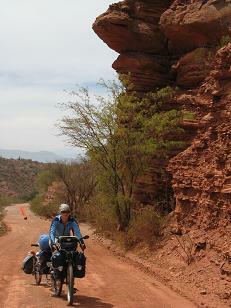 This part of Argentina was no different, we were still riding through sandy desert. Clouds started to come in and once more we were looking for a sheltered place to camp but there was none. 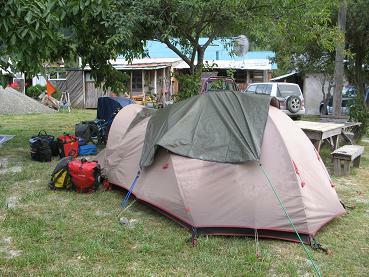 We put the tent up at the foot of another hill, behind a gravel mound right next to the highway. And as it happend the other night, the first raindrops fell, when Flo came into the tent, only this time with a steaming pot full of pasta. The clouds were still there in the morning. We packed our bikes and rolled off, observing the sky. As ususal it was impossible to tell in which direction the clouds were moving. I wanted to hitch hike. I was not in the mood of getting soaked in this desolate land. We still had to ride one more day to reach the first town. The sky around us grew darker and finally it rained all around us. We stopped to put on our raingear and wrap our shoes with plastic bags. Flo wanted to ride, I wanted to get a ride. There was hardly any traffic and mostly small cars. The trucks that passed didn’t have any space, so we kept riding through the first rain. There was no thunderstorm yet, but another salt flat to cross. In the middle of the flat Flo wanted to stop for lunch. Men are always hungry in the most impossible spots. We stopped and even got some rays of sunshine. I tried to get a ride again with no luck. I was in a really bad mood. How many times did we have to take flight from thunderstorms?! And now again it was black all around, no thunders yet but it could be extremely dangerous to be caught in one on the salt flat. I was just done with this situation, this nightmare. I wanted it no more! It started to hail and the wind was blowing the ice kernels into our faces twinching cheeks and forehead. I was soaked within seconds, my rain jacket is only jacket. When we were passed that storm, I was done with biking. Every time I saw a truck in the back mirror I told Flo to stop and we tried to get a ride. The third truck stopped and led us get on. It was so nice to be inside the driver’s cabin and watch the clouds outside without fearing to get hit by hail or lightening. Our clothes slowly dried while an engine worked to get us 150km further. 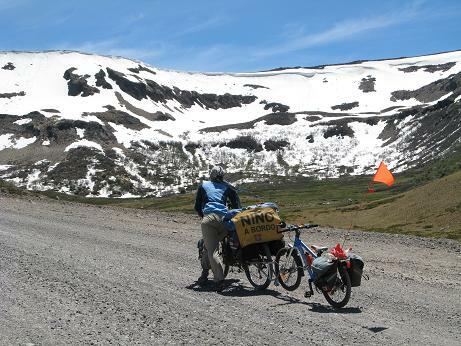 The truck brought us up onto the last pass of 4300m, the entrance to the argentine summer. I felt so good. I didn’t regret that ride at all. I was more than done with desert and storms. All I wanted was smelling grass again, listening to the songs of birds and the wind playing with the leafs of trees. Riding down those 30km was like a dream. At first scattered tussocks appeard between rocks and sand, then a cactus now and then. A few bushes covered the ground in a dent. Soon there were more plants on the ground than bare rocks and suddenly we discovered the first trees way down in a canyon. We passed truck after truck, letting go of the breaks to get closer to the green. With the first scent of the trees in my nose and the sound of birds in my ear I had tears in my eyes. I was so happy – We had passed another milstone on our journey! Finally in Argentina we had to decide about our further route. For us it was now too late in the season to try and get all the way down to Patagonia. 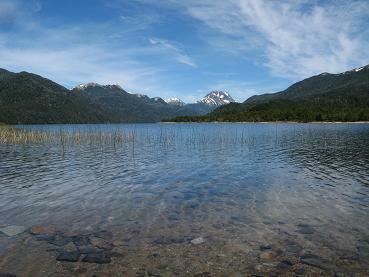 By the time we would reach Ushuaia, the most southerly town in the world, it would be deepest winter there. That’s why we thought about a loop through Paraguay, Brasil, Uruguay and back into Argentina. There were two problems with this idea: Northern Argentina at this time of the year is in the season of thunderstorms and rain and can get temperatures past 40 degrees celsius. Moreover would our money probably just have lasted to reach Buenos Aires. We thought about giving slide shows in Buenos Aires, though we wouldn’t have any guarantee of actually making some money to continue our journey. 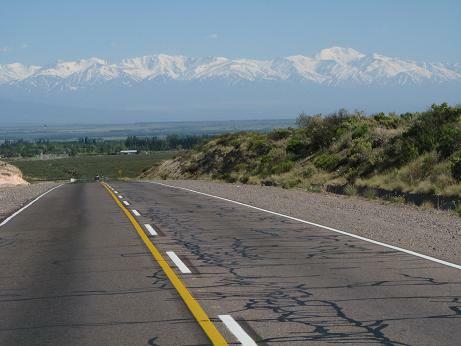 Then we had the idea to continue southwards with a loop through the mountains by Cordoba, take a break in Mendoza and give slide shows there. But after a phone conversation with my sister I came up with a third idea: What if we would fly to Switzerland for a few months to work and then continue our journey with more money and at a better time of the year? Without beeing sure of actually getting a job at least for Flo, we didn’t want to risk buying flight tickets. So we sent some e-mails out to potential employers to check out the situation in Switzerland. Next morning we had an answer from Flo’s ex boss. He wrote that he had a job for Flo, if he could start within the next two weeks. If not he would give the job to someone he had just interviewed the day before. He needed to make his desicion at the latest in two days. It was not an easy desicion for us. The flight to Switzerland was incredible expensive. The move to Switzerland would cut off the thread of our journey very abruptly, but there was not really time to think about it. We needed the money. We would see our families, Chan could connect with his cousins he had never met before and I could work on a slide show to give in Switzerland. So we decided to go for it. 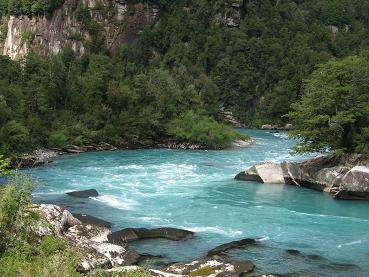 It was a journey of four days with 20 hours by bus from Salta to Buenos Aires. We are in Switzerland now, living with my sister and her partner in Winterthur, sharing a three bedroom apartment. Flo has already worked in the Landscape Architecture office for one week. I am still trying to adjust to all the changes, the culture, the climate, the language. 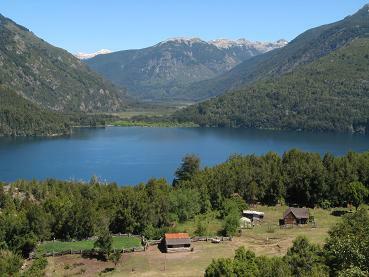 Half a year we will be here, our flight back to Argentina is booked for the first week in September. 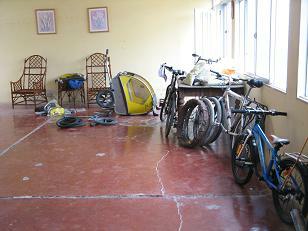 Our bikes are waiting for us in the “casa de ciclista” in Salta. La Paz, or better the “casa de ciclista” from Linda and Roul there, was the perfect spot for Chan to turn four. 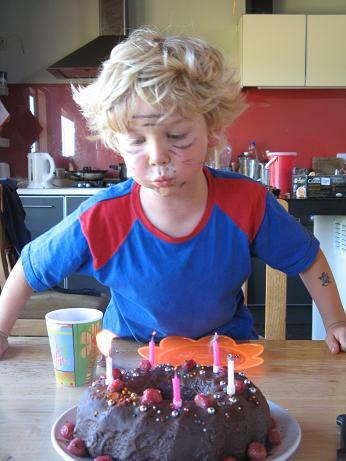 He got a real birthday party with kids to play, cake, ice cream and gifts. Chan was sad to leave that place, but once we got our package with spare parts for the trailer out of customs, it was time to ride further south. We wanted to reach the Salar de Uyuni, the worlds largest salt flat, before it got water on its surface. The rainy season had just begun and usually is wetter in the North than the South, so we might just be lucky. Roul drove us up through the worsed part of the city and so we only had to climb up to the rim for 9km. Once back on top it was pretty flat all the way to Oruro with only one longer climb. It took us four days to cover those 230km. There was much wind and we got into another tempest with hail. Whenever kids saw us coming, they would run to the roadside, kneel down and hold up their caps or ask for “regalos” (gifts). We were worried about the weather. Every day we could obsereve rain and thunderstorms all around us. Was there water already on the Salar or was it still dry and crossable? We asked people on our way south and the answer was always the same: “El Salar? Seco es! No hay lluvia, no hay agua.” Neverthless, when we got to Huari, the end of the paved road, we looked for a ride in a truck. 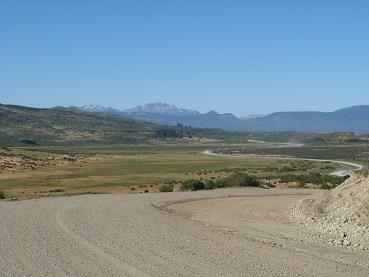 We knew that the gravel road to Salinas, at the edge of the Salar, was exceptionally bad: sandy with horrible washboard. After hours of waiting, a truck finally gave us a ride for some 70km, a bit passed Quillacas. This was better than nothing. In the dark they let us off and we put up our tent Chan waited in the trailer. At this hour we were all too exhausted to be cooking, so we ate some carrot and cucumber sandwiches and went to bed. Chan slept within seconds. Next morning we had some different visitors: Llamas were grasing around the tent curiously coming closer and when I lifted one backpack out of the vestibule, a small white skorpion fled away and under the tent floor. 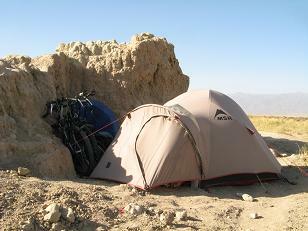 Riding wasn’t much fun for the next two days, but we had an aim: to reach the Salar in dry condition. We couldn’t turn around anymore now. 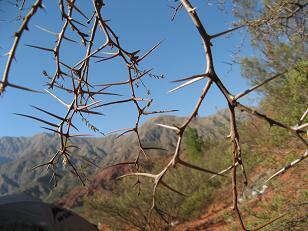 Around us was dry desert pampa with no other vegetation than stringy grass and thorn bushes. We saw some owels flying away and vicuñas and for the first time emus from very far, a huge bird that runs on its two legs instead of flying. Another night in the tent and anoter thunderstorm with hail and hard rain went by. Then another day of riding and pushing over a sandy washboard dirt track. After 20km riding one day, we expected to get a glimpse of Salinas any moment. But instead Flo stopped and pointed to the trailer. I couldn’t see at first, but finally I realised that the two wheels were in a weird angle to the trailer and then I was appalled: “The axis!”, I screamed, “oh no, what should we do now?” Well, Chan and I waited by the broken trailer while Flo rode off to get motorised help from Salinas. The trailer with its broken axis couldn’t be moved otherwise anymore. It was two more kilometers to Salinas, luckily no more, and Flo found a pickup and its owner quickly who came to get us. Lucky too there was a mechanic in the village who could fix our trailer for a horrenduous prise and only for the next day. It would have been the perfect day to head out onto the Salar with blue skies and no clouds at all, but we had to spend the day in Salinas, waiting. There were clouds on the horizon, but above us the sky was blue and so we rolled off with a fixed axis on the trailer. Our route was beautiful. At first the path was still sandy and bumpy, but then we entered the hard pampa at the edge of the salt flat, which was very smooth to ride on. The view of vulcano Tunapa was great and we were happy to be so close to entering onto this huge salt flat. Then the road went back onto mainland for about 10km and we were stuck in sand again. When we passed a village, a herd of llamas was close by and one of them came galloping towards us. It almost ran Flo over. I was behind and stopped to let it go by, but it came straight for me. I wanted to move, but Flo called: “Stop, don’t move, this is perfect for a picture!” But this llama was a bit too intrusive for me and I quickly pushed my bike to Flo’s side. He was still fumbling with his camera which the llama found very interesting and put his head into everything. 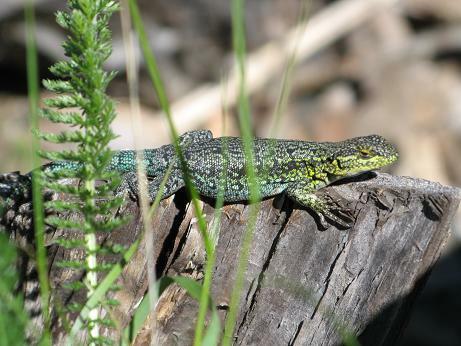 For me it was too much as it pushed me into Florian and tried to climb on me. I screamed and let go of my bike. Luckily Flo could grip it, so it didn’t fall to the ground. The llama now thought it to be a funny game to chase me and while we ran rounds around Florian, the trailer and the bikes, Flo ordered us to stop and calm down. He said: “Rebekka, get onto your bike and ride off!” “I can’t, he will follow me!”, I screamed back. But somehow I managed to take my bike and take flight, while Flo got a hold onto the llamas throat and told him to get to his senses. When this didn’t work he took his dog stick and finally the llama ran away. Shortly after this we got to another village, where we were told was an easier access to the salt flat, than from the official ramp at Jirira. They said, like this we wouldn’t have to climb over a pass on a rocky path but could rather ride around it. Nobody had told us though, that this side of the Salar was the wettest. It was a grandious feeling to be at last on this huge, flat, white land of salt! We had made it! After only a few minutes riding we were covered in salt and looked like bike riding snowmen. We passed the salt blocks where they harvest salt and looked for the island we were told we needed to pass. The way around was much further than we had believed it to be from people’s descriptions. The clouds from this morning were suddenly very close and we started to hurry. In our backs the thunder was growling. A tempest on the salt flat was the least we wanted to experience. So we hurried foreward and finally could make out the ramp to Jirira. The black clouds passed by our side and when we reached the only hospedaje and store in the otherwise empty village, the sun was back smiling at us. Luckily there was water. We spent the rest of the afternoon cleaning our bikes and shirts which were stiff from the salt. The light was dim, when we woke up early next morning. The sky was coverd with clouds. Flo went to ask the hotel owner for advice. He told us to ride out onto the Salar, that they would have rain that night for sure, but that it was very rare to get thunderstorms on the Salar. We should try and make the 100km to the other side in one day. The ride on the sea of salt was a bit relaxter this time, for the sun burned most of the clouds away and the salt surface got nicer and dryer the further we rode. But then it started to drizzle a little and the sun was hiding again. We were hurrying once more. 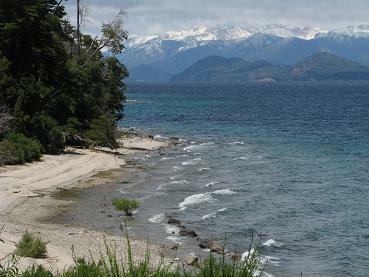 By lunch time we reached isla de pescado, where jeep load after jeep load of tourists arrived. We asked the local drivers about the weather and salt conditions and the southern end of the Salar. Of course they can’t predict the weather, but they adviced us to stay on the island for the night if we couldn’t make it off the Salar that same day, because there was a big chance of getting rained on that night. For the Salar that could mean getting a layer of 2-5cm of water in which we wouldn’t want to be camping. On the island was a beautiful path through cacti and from its top we had a panoramic view of the whole salt lake. We stayed in a hut, the bikes ready to go for early next morning. It had just gotten dark, when the raindrops started their rhytmic music on the roof. Shortly after our room was lit in white light and dark again. The growling thunder added his part to the tune. Blue skies and no clouds at all awaited us in the morning as well as a Salar turned into a lake. Flo went to check the depth of the water and found it to be only about 2-3cm deep Should we ride out or not? 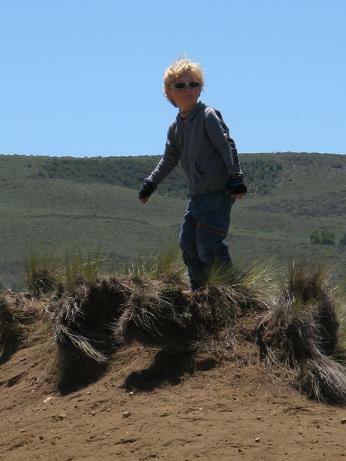 We had already decided to go to Uyuni in the east instead of San Juan on the southern end. In the south we would have more sandy washboard paths that by now had probably turned into mudholes. The day was so beautiful that we started to ride. It was pretty eerie because we couldn’t really make out the depth of the water and it just looked like we were riding through a huge lake. Also it was very hard to see the tracks of the jeeps we had to follow in order of not getting lost. There were no landmarks by which to know the directions. After about 5km the surface got dryer and was finally completely dry and easy to ride on. Now we started to really feel the intensity of the sun, reflecting on the big white. 70km it was to the ramp at Colchani. About 3km before getting back onto land, the Salar became very wet and this time soft and muddy as well because they were harvesting salt right around the ramp. I was very upset because we got wet and salty feet so close before getting off the Salar. It is so shortly sighted not to leave a dam for the cars and busses crossing the salt flat. But then we were off it and very happy. We finally crossed the Salar de Uyuni ourselves and just in time! Colchani was a miserable little village and there was no place to stay besides some star hotels at the edge of the salt. 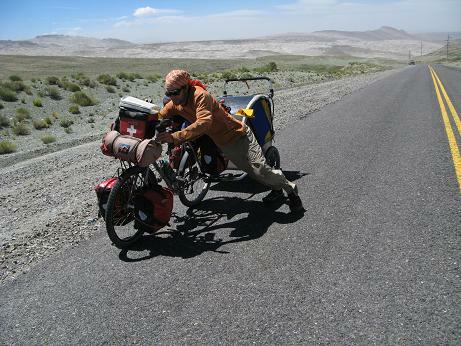 It was mid afternoon and we decided to keep going for the remaining 25km to Uyuni on gravel and sand. We wanted to take the train to Chile. The roads leading there are really bad and with all that rain probably almost unpassable for us. But aparently the train to Chile consists of only one wagon and you can’t take luggage on it. So we were told at the train station. We could show up at 3am, just before the train’s departure and talk to the conductor, for he would maybe let us on, we were told too. Instead of getting up in the middle of the night, not knowing, if we would get a ride or not, we prefered to take the bus. There we got space for all our bikes and we knew we had a seat. Chile doesn’t allow bolivian busses to enter their country and Bolivia doesn’t allow chilenian busses to enter their country. Everybody has to get off in the noman’s land zone between the two countries and switch busses. We just unloaded our bikes and rode to the chilenian boarder post ourselves, while the other passengers had to wait for their bus. Chilenian immigration can take 2-4 hours if you’re in a bus. It took half an hour for us. But we didn’t know, that we couldn’t bring honey into Chile. We are sure that the immigration officer is enjoying it now himself. Even if it was only midday, it had been a long day for us and we decided to stay in Ollague, the border village. We also had to stock up on water and food for the next three days on gravel, washboard and sand in the Atacama desert, aparently the world’s dryest place. For 200km there was no vegetation at all, not even cacti. We were surrounded by smoking vulcanoes and boulder. We passed another salt flat, had to climb a hill, but there was no place to hide from the sun and no place to rest in the shade. Our tent we put up in a recess of the boulder to be sheltered a little bit and hidden from the road. The next day we reached a campamiento by noon and found a store there, where we could fill up our water from the tap. The store had a few rolls of cookies and crackers, three bottles of coca cola, two cans of tuna, one can of cream and two cans of peaches. We bought coke, crackers, the cream and a can of peaches. From here the road was supposed to be better. It was only true for the next 7km, where it was sealed with salt. Then we were back on sand and a strong head wind added to the strains. 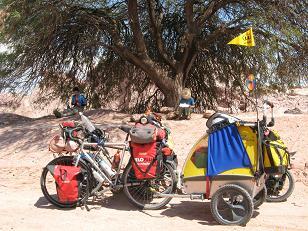 We made it 50km through the desert before we set up camp in a gravel pit. Now the road was sealed again, downhill mostly and we enjoyed a nice tail wind for about 20km. 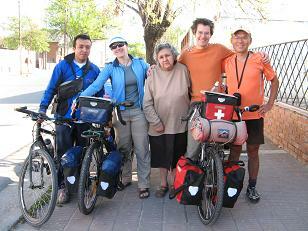 We wanted to reach Calama and ride 100km that day. 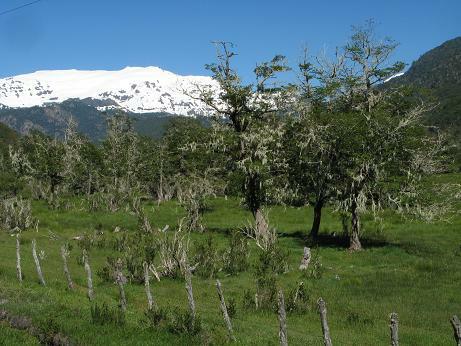 Our lunch break we took in Chiu Chiu an oasis with the first green vegetation in Chile. From here we had headwind for the remaining 30km which took us 5 hours! 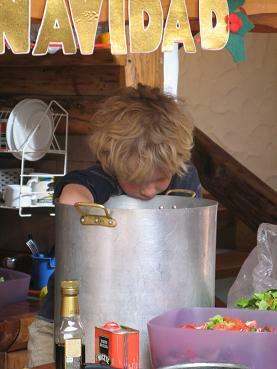 But we were in Calama now, it was hot and one day before Christmas. We checked into a hotel for one night. They were closed for Christmas. Next morning we went to look for another one and had quite some trouble finding one that stayed open. Then we went to the supermarket to buy food for our next leg of the journey, again through the Atacama desert for 300km, over 4800m and with no water or food along the way. The store was overflowing with people There were no empty carts. People were trying to get one by catching people finished with their shopping, following them to their cars to be able to get a hand on the cart. Finally after about 15 minutes, we were lucky as well and could start our shopping. It must have been about two hours later, when we got ourselves an ice cream and sat down exhausted in the supermarket’s own cafeteria, before standing in line for check out. 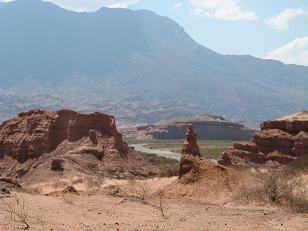 We are now in San Pedro de Atacama, an oasis two day rides east of Calama. Here we want to relax for a day or two and take a jeep tour to the wonderland of geysirs before heading out into that lonely 300km part of way into Argentina. ” Flo, sind wir auf der richtigen Strasse? Ich möchte keinesfalls diese Strasse wieder bergauf zurück in die Stadt fahren müssen!”, sagte ich. Also fragten wir erneut nach dem Weg, bereits zum vierten mal und wieder wurde uns versichert, dass diese Strasse nach Izcuchaca und weiter nach Ayacucho führt. Unsere Straßenkarte verzeichnete zwei Strassen nach Ayacucho, der nächst größeren Stadt nach Huancayo. Wir suchten die Route auf der rechten Seite des Flusses nach Izcuchaca und in die Berge und nicht die Route durch das trockene und heiße Flusstal. Momentan befanden wir uns auf der falschen Seite des Flusses und auch die Straßennummer stimmte nicht überein. Endlich erreichten wir eine Kreuzung, auf der wir in ein Dorf abbiegen konnten, dass auf unserer Karte war, aber nach etwa drei Kilometern machten die Strasse einen großen Bogen und führte genau wieder in die Richtung, aus der wir kamen. Wieder fragten wir nach dem rechten Weg und wurden zur Kreuzung zurückgeschickt. So langsam dämmerte uns, das unsere Karte absolut nicht stimmte. Später fanden wir heraus, dass die Karte eine nicht existierende Strasse verzeichnete und die Strasse, die wir nehmen mussten war falsch markiert und Teile davon fehlten auf der Karte völlig. Nach einem Umweg von 10 km waren wir wieder auf der richtigen Fährte und radelten auf einen ganz normalen ” über 4000m” Pass. Die Landschaft war hier trocken und felsig, die Erde tieforange. Die gesamte Fläche bis hinauf in die Berge wurde eingeteilt in schmale Rechtecke, landwirtschaftlich genutzt. Schon bald wand sich die Strasse wieder bergab und wir glitten an Dörfern und Feldern vorbei, verloren all die Höhenmeter, die wir mühsam erklommen hatten. Eigentlich hielten wir Ausschau nach einem Restaurant für die Mittagspause, aber keines war geöffnet und als wir in dem letzten Ort vor Izcuchaca anhielten kamen Kinder derart schreiend und lachend auf uns zugerannt, dass wir schnell die Flucht ergriffen und bis zur Bahnstation in Izcuchaca nicht mehr anhielten. Von hier wollten wir am nächsten Tag zur Abwechslung 70km mit dem Zug nach Huancavelica fahren. Aber wir sind in Peru und nichts ist sicher, also ging ich gleich mal zum Schalter, um mich nach dem Fahrplan und dem Preis zu erkundigen. Es stellte sich heraus, dass morgen gar kein Zug fuhr, sondern heute, genauer gesagt in 15 Minuten. Der Angestellte bezweifelte, dass die Fahrräder im Zug Platz finden würden. Normalerweise ist Gepäck in Peru kein Problem, irgendwie geht es immer. Also sagte ich ihm, dass wir es auf alle Fälle versuchen wollten. Den Anhänger falteten wir auf Rahmengröße zusammen, packten den Inhalt in unsere Rucksäcke und entluden die Bikes. Bei diesen Vorbereitungen wurden wir von einer Gruppe Kinder genau beobachtet. Endlich rief der Fahrkartenverkäufer den Zug aus und der Schaffner meinte für unsere Räder sei Platz in der Zugmaschine. Der Fahrkartenverkäufer bezweifelte dies und teilte uns seine Bedenken im Minutenabstand mit. Der Zug fuhr ein und viele Menschen mit ihrem Gepäck stiegen ein und aus. Flo brachte die Bikes zur Lok und konnte sie dort festbinden, während ich unser Gepäck in den Wagon lud und Chan bewachte derweil unsere Sachen. Der Anhänger fand bei uns Platz und schon rollten wir aus dem Bahnhof hinaus. Wir hatten zuvor die Zuggleise gesehen, meist zugewachsen, angefüllt mir Erde und auch nicht sehr gerade. Aber wie fühlte sich das im Zug an! Er schwankte von einer Seite zur anderen. Wir beschlossen uns nicht zu sorgen, sondern die Fahrt zu genießen. Da wir mittlerweile sehr hungrig waren, kauften wir Brot bei einer Verkäuferin im Zug. Die Gleise folgten einem Fluss durch einen schmalen Canyon, langsam, sehr langsam gewannen wir an Höhe. An jeder Haltestelle stiegen noch mehr Menschen mit großen Bündeln Gepäck zu. Die Haltestellen waren ein Chaos von hin und her eilenden Leuten, Frauen und Kinder verkauften Brot, andere Lebensmittel und Getränke. Jungen warteten mit ihren dreirädrigen Lastenrädern auf Kundschaft. Dann begannen die Tunnel. Mittlerweile war die Dunkelheit hereingebrochen und jedes Mal, wenn wir einen Tunnel befuhren, wurde es pechschwarz im Zug, da es keinerlei Licht gab. Draußen gab es fast nichts mehr zu sehen und im Zug begannen die Leute mit dem Schaffner über die Fahrpreise zu diskutieren, schoben das Gepäck hin und her, aßen und tranken. An einer Station betraten zwei Frauen den Zug, über und über beladen mit schweren Bündeln voller Kräuter. Sie nahmen gegenüber von unserem Gang Platz. Die Kräuter dufteten aromatisch aber langsam begann sich ein starker Knoblauchgeruch auszubreiten. Flo fand bei einem Toilettenbesuch den Grund dafür, eine Frau hatte lauter Beutel mit geschälten Knoblauchzehen in dem winzigen Klo gestapelt. Als wir auf einer Schotterstrasse Huancavelica verließen, rannten uns aus jedem zweiten Haus Hunde hinterher. Der Morgen hatte schon schwierig begonnen, Chan brachte mich auf die Palme, weil ich ihm nichts Recht machen konnte, bald wollte er das, dann das. Als wir das Hotel verließen hatten wir wieder mal Zuschauer, sie versuchten Chan in seinem Hänger anzufassen und jetzt diese dummen und gefährlichen Hunde. Ich war bedient. Nur ein paar Kilometer hinter der Stadt änderte sich die Landschaft und war einfach wunderschön, auch die Strasse war ok und so besserte sich meine Laune zusehends und ich genoss die Fahrt. Bald sahen wir viele Lamas und Alpakas. Die Felsen in ihren leuchtenden Orange und Rottönen wirkten fast surreal. Auf 4170m Höhe sollte sich ein Dorf befinden, aber es war verlassen. Also machten wir Picknick vor der Ruine eines Lehmziegelhauses und aßen Brot, Oliven und Käse. Der Wind frischte auf und ich begann die Höhe in Form leichten Schwindels zu fühlen. Wir folgten der Strasse zu einer der höchsten Hochebenen in Südamerika (über 4400m). Plötzlich kam eine Herde Lamas in vollem Galopp die Strasse entlanggeprescht. Vor uns wurden sie langsamer und dann ging eines nach dem anderen an uns vorbei. Flo holte Wasser aus einem Bach und wir suchten einen Platz zum Übernachten. Es gab keine Büsche oder Bäume, nur Pampa. So versuchten wir unser Zelt hinter einem kleinen Hügel neben der Strasse zu verstecken. Am Morgen zog eine Herde Schafe an unserem Zelt vorbei, Kinder spielten nebenan und eine Frau kam vorüber, rief etwas auf Quechua und eine Weile später kam sie mit Schafen zurück. Eigentlich hätten wir unser Zelt direkt neben der Strasse aufstellen können, wohl das ganze Tal wusste, dass wir hier waren. Die Strasse führte in Richtung eines roten Berges, der jetzt in der Morgensonne regelrecht strahlte. Immer noch fuhren wir bergauf und am Horizont zeigten sich neue Gipfel, je höher wir kamen. Die Felsen leuchteten in immer neuen Farben, als ob sie im Regenbogen gebadet hätten. Oft mussten wir anhalten um diese Schönheit der Bergwelt zu bestaunen. Weiterhin fuhren wir bergan und die Strasse führte hinauf und hinauf, bald müssten wir den Himmel berühren können! Die Passhöhe war auf 4853m. Von einer Seite zogen dunkle Regenwolken auf, auf der anderen hatten wir eine zauberhafte Sicht auf Bergketten, Seen und Felsformationen. Die Wolken trieben uns zur Eile. Entlang der Seen lebt ein kleines Tier, eine Art Murmeltier, dass anscheinen dem Hasen die Ohren gestohlen und orange angemalt hatte, der Schwanz stammte vom Eichhörnchen, nur schien die Spitze verbrannt, wie sonst konnte sie so kohlrabenschwarz sein. Es war schnell, das kleine Wesen, wir schafften es nicht es auf Film zu bannen. Die Nacht verbrachten wir in Santa Ines auf über 4600m. Unsere Herberge hatte kein Wasser, nicht mal einen Eimer, um die Toilette zu spülen. Als Florian nach Wasser fragte, bekam er von dem Jungen zur Antwort: ” Wir haben selber keins.” Aber hier gibt es einen Fluss und einen See!” Der Junge zuckte die Schultern: “Der Fluss ist durch die Bergbaumine verseucht und der See ist tot.” “Aber woher bekommt ihr euer Wasser?” fragte ich. “Wir müssen es von weit her holen. Seit zwei Wochen hat das Dorf kein Wasser mehr, da die einzige Quelle ausgetrocknet ist. Die Regierung hat versprochen, etwas zu tun, also haben wir vielleicht in zwei oder drei Wochen wieder Wasser.” Erklärt der Junge. Zwanzig holprige Kilometer brachten uns zurück auf den Asphalt. Erneut ein Pass, eine Abfahrt und wir befanden uns auf dem Weg zu unserem zweithöchsten Pass. Es war ein langer Anstieg und es wurde bereits spät. Im nächsten Dorf fragten wir nach einer Herberge, statt dessen konnten wir die Nacht in dem einzigen Patientenzimmer der Krankenstation des Roten Kreuzes verbringen. Eine nette Geste der Aerztesin, allerdings waren die Kinder des Dorfes besonders aufdringlich. Beobachteten uns aus nächster Nähe, während wir draußen unser Essen zubereiteten und starrten durch das Fenster, als wir aßen und unsere Betten aufschlugen. Das winzige Hospital hatte keine Elektrizität, nur einen Generator für den Notfall. Die Toilette war außer Betrieb, statt dessen gab es ein Loch im Garten. Mindestens hundert Kehren brachten uns auf eine Höhe von 4750m. Oben wartete bereits ein LKW auf uns. Einige Frauen und Kinder kamen uns entgegen. “Nicht mal hier oben sind wir alleine!” knirschte Flo durch die Zähne. Also gab es wieder mal eine typische -ein paar Fotos machen, Kekse essen, Sand gegen den Wind schmeißen und dabei beobachtet werden- Pause. Dann sausten wir hinab, hinab hui hinab, die Regenbogenberge, Felsen und gelbes Grass flogen vorbei. Fast 50 km ging es bergab, auf flache 1900m und in wärmere Gefilde. Statt der Lamas gab es nun Kühe, Pferde und Esel und statt der kargen Pampa, Eukalyptusbäume und Kiefernwälder. Im Tal beendeten wir unsere Fahrt für heute und tranken noch einen Kaffee, bevor wir uns in unser “Quartier” begaben. Dort wurde die Bettwäsche noch schnell durchs kalte Wasser gezogen, in der Sonne getrocknet und uns überreicht. Flo räumte den Müll aus dem Zimmer, dann konnten wir unser Gepäck reintragen. Nun, wir zogen es vor, in unseren eigenen Schlafsäcken und im Zelt, dass wir im Zimmer aufgestellt hatten zu nächtigen. Weitere 27 Kilometer brachten uns zum letzten Pass vor Ayacucho, dieser war nur 3900m hoch. Am frühen Nachmittag trafen wir in Ayacucho ein. Vor uns lag ein Wegstück, das Extreme versprach. Einige Pässe von über 4000m und dazwischen heiße, tropische Täler, die Straße zudem unasphaltiert. Folgende Informationen über die Strasse hatten wir von Freunden erhalten: viele Abschnitte glichen eher einem Flussbett, als einer Strasse, wir mussten viel schieben. Noch einen Monat galt unsere Aufenthaltsgenehmigung für Peru. Dieser 380km lange Schotterabschnitt würde uns mindestens zwei Wochen kosten. Zwei Wochen, die uns keinen Spaß machen würden und Chan wäre wohl auch kaum glücklich mit einer weiteren Schütteltour. Also entschieden wir uns für den Bus, er uns nicht nur extreme Anstrengung, sondern auch das Geld für die Visaverlängerung sparen würde. Wir erkundigten uns bei ein paar Busgesellschaften, doch es gab nur eine Einzige, die diese schwierige Strecke befuhr. Wir buchten die erste Sitzreihe, um uns wenigstens ein bisschen an der Landschaft erfreuen zu können. In der Nacht vor der Abfahrt packten wir alle unsere Sachen aus dem Anhänger in Rucksäcke und um 6 Uhr früh rollten wir durch die Stadt zum Busterminal. Dort klappten wir den Anhänger zusammen. Als der Bus eintraf verlud Flo die Räder und unser Gepäck, während Chan und ich auf die anderen Sachen aufpassten. Die erste Überraschung war, dass wir nicht ganz vorne saßen, sondern in der zweiten Reihe. Das war leider nicht mehr zu ändern, aber die Vordersitze waren von ebenfalls zwei Touristen besetzt, die nach der Hälfte der Fahrt mit uns tauschten. Der erste Abschnitt nach Andahuylas dauerte 10 Stunden. Zur Mittagszeit hielten wir an einem Restaurant. Ich blieb noch im Bus sitzen, um Apfelstücke für Chan zu schneiden, während die beiden Pinkeln gingen. Als ich ebenfalls aussteigen wollte, musste ich feststellen, dass die Tür verschlossen und ich eingesperrt war. Keiner hatte uns darauf hingewiesen, dass wir während der 40 minütigen Pause weder in noch aus dem Bus konnten. Der Fahrer war unauffindbar. Um fünf Uhr Nachmittag kamen wir in Andahuaylas an. Hier mussten wir umsteigen, der nächste Bus sollte um sieben abfahren. Ich besorgte uns etwas zu essen, Reis mit gebratenen Zwiebeln. Es begann zu regnen und wir suchten für uns und unser Gepäck einen Unterstand, endlich kam der Bus. Als Flo begann, die Räder aufzuladen, sagte man uns, dafür wäre kein Platz. “Gut, dann lade ich die Räder halt zu den Passagieren!”, meinte Flo. “Wir haben die Tickets in Ayacucho bis nach Abancay gekauft und wir haben extra für das Gepäck bezahlt und wir werden in diesem Bus mit unserem gesamten Gepäck mitfahren, wie ihr wisst fährt morgen wegen der Volkszaehlung kein Bus!” Jetzt gab es plötzlich Platz, aber als kleine Schikane musste Flo noch die Vorderräder ausbauen und einer unserer Rucksäcke wurde weit weg auf der anderen Busseite verstaut. Im Bus wartete eine nette Überraschung auf uns: Tee und Gebäck wurden serviert. Es war bereits dunkel, als wir Andahuaylas verließen. Der Bus fuhr furchtbar langsam und hielt aus unerklärlichen Gründen auch noch immer wieder an. Chan war gleich eingeschlafen. Nach etwa vier Stunden wurde ich ungeduldig, warum fuhren wir so langsam? Endlich sahen wir tief unter uns im Tal die Lichter von Abancay. Die Abfahrt war eine Tortur. In riesigen Schleifen zog sich die Strasse über den gesamten Berg und verlor dabei kaum an Höhe. Auf halber Strecke stoppten wir und das Personal wechselte mit einem entgegenkommenden Bus. Busse anderer Gesellschaften überholten uns. Warum konnten die schneller fahren? Statt wie geplant um 10 Uhr erreichten wir Abancay erst um 1 Uhr nachts. Jetzt mussten noch die Fahrräder und das Gepäck abgeladen und der Trailer wieder zusammengebaut werden. Chan wachte auf und klammerte sich an mir fest, bis wir ihn in den Anhänger setzten konnten, wo er sich wieder sicher fühlte und zu spielen begann. Um halb 2 machten wir uns auf die Suche nach einem Hotelzimmer. Die meisten Hotels waren bereits geschlossen. Wir fanden endlich eins, das noch offen war, es war wirklich schäbig, aber wir hatten keine Wahl. Zumindest war der Besitzer nett, er half uns die Räder und alles hoch ins Zimmer zu tragen. Es war nach zwei, als wir endlich die Augen schlossen. Wir freuten uns schon auf Cuzco. Drei oder vier Fahrtage und wir würden unsere Schweizer Freunde (www.affenbrunner.ch) und Steven den Australier wiedersehen. Wir planten einige Ruhetage, wollten die Fahrräder putzen und Machu Pichu anschauen. 36km bergauf, eine Steigung von 1500m, führte uns aus Abancay heraus. Auf dem Pass bot sich noch mal der Blick auf die Stadt. Es begann zu hageln und zu regnen, so dass wir schnell, für die ebenfalls 36km lange Abfahrt auf 2680m Höhe nach Curahuazi die Regenkleidung anzogen. In der Nacht bekam Flo Durchfall. Aber er wollte morgens trotzdem weiterfahren, Cuzco erwartete uns. Hinab flogen wir, die Brücke über den Fluss trug ein Schild 1900m, dann folgte die Strasse dem Fluss bergauf durch ein superheißes Tal. Flo und ich hatten schwer zu kämpfen, ich wie immer mit der Hitze und Flo fühlte sich einfach schwach. Wir mussten eine Pause im Schatten einlegen und ich hielt den nächsten Pick up an. Die netten Leute fuhren uns in die nächste Stadt, wo wir in einem Hostal ein Zimmer nahmen und Flo sich mit hohem Fieber ins Bett legte. Am Abend traf ein österreichisches Paar auf einem Tandem ein. Chan und ich unterhielten uns mit ihnen bis spät in die Nacht. Am Morgen war Flo fieberfrei und wir starteten, nachdem wir uns von den Österreichern verabschiedet hatten, erst um 10 Uhr. Langsam gewannen wir an Höhe, den Pass erreichten wir um 3 Uhr nachmittags. Schneegipfel säumten den Horizont. Hier oben war es herrlich, auch das Klima entsprach mir eher. Trotzdem fühlten Flo und ich uns unwohl. Die Abfahrt war nicht sehr steil und die Strasse blieb auf über 3300m. Kurz vor der Stadt, in der wir die heutige Übernachtung eingeplant hatten, stoppte uns ein großer Graben. Die Strasse wurde erneuert. Die Autos fuhren einen kleinen 4km langen Umweg über Schotter. Während wir da standen und überlegten, was wir tun sollten, kamen einige Straßenarbeiter und zeigten uns eine Strecke über einige kleinere Gräben und die Felder. Sie halfen uns sogar den Trailer und die Räder darüber zu heben. Den weiteren Weg legten wir ungestört zurück, sogar die Regenwolken machen einen Bogen. In dieser Nacht bekamen Flo und ich Halsweh. Cusco war nur noch 26km entfernt ohne große Steigungen. Gegen Mittag erreichten wir das Hostal und gingen etwas zu Mittag essen. Als wir zurückkamen, hatte Flo wieder hohes Fieber. Während der nächsten Tage kam und ging das Fieber, also gingen wir zum Arzt, der natürlich gleich Antibiotika gegen eine Luftröhrenentzündung verordnete. Die Schweizer Rahel and Jörg und der Australier Steven blieben noch einen Tag länger, um mir zu helfen. Sie kümmerten sich um Chan, während ich mich um Flo sorgte und mich endlich etwas ausruhte. Kaum dass sie uns verlassen hatten, bekam Chan Fieber. Nach sechs Tagen erholte sich Chan langsam von seiner Grippe oder was das Fieber verursacht hatte, da erwischte es mich und das Fieber fesselte mich eine Woche ans Bett. Das entsprach so gar nicht unserer Vorstellung vom Aufenthalt in Cuzco, der alten Inkastadt. Seit zwei Wochen sind wir hier und haben kaum etwas anderes gesehen als unser Zimmer, das Internetcafe und den Markt, um frische Früchte zu kaufen. Nun ist der Plan Machu Pichu zu besuchen, nach Cuzco zurückzukommen und die Fahrräder fertigzumachen für die Fahrt durch das Altiplano. So we made it through Peru, the most challenging country so far on our journey. Challening in different ways, so for example due to the rapid climate changes from tropical heat and humidity to freezing cold temperatures at the high passes within a days ride or two. 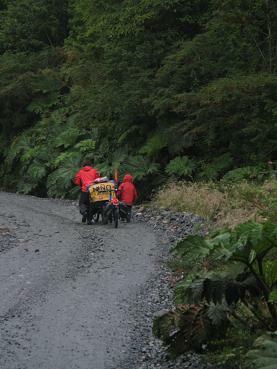 Some of the roads were really bad and we had to push the bikes somethimes for hours over riverbed like paths. And finally we never felt very comfortable with the majority of the people we met along the way. They seemed to have a different understanding of private space touching Chan and our bikes whenever we stopped. 20 to 30 kids and adults would gather around us immediatly, starring at us and touching our things. Especially mothers would then start to criticize the way Chan was dressed: too cold or too hot. They would then try to convince us, that Chan couldn’t breath in his trailer or that he was hungry or needed a drink, when he was perfectly fine. Somethimes kids were running after us, catching up and pulling on the trailer or the bikes backwards. All these unpleasant experiences don’t however overshadow that we also met amazingly hospitable and friendly people and although warned many times about robberies, never had an incident nor felt at the slightest threatened. After two weeks staying in Cusco beeing sick one after the other, we finally managed to organize our trip to Machu Pichu, the “lost city of the Incas”. Since it costs an incredible amount of money to get there and another fortune to see the ruins, we didn’t want to spend another awful lot of money for the bus up a steep hill (500m up) to the entrance of the ruins. Instead we got up at 4am and took a nice one hour hike up to the gate. Chan wasn’t ready to hike yet, sleepy he was sitting in the ergo carrier on my back half way up, then Flo took him over and I got our backpack with food, water and spare clothing for Chan instead. At the gate we weren’t allowed in with our bigger than 20l pack (A person is allowed to take a 20l backpack into the site. ), the guardian wasn’t discussing at all, we had to go to a woman apparently in charge of storing backpacks. But as soon as we entered her office, she yelled at us that we wouldn’t respect rules and that she wasn’t talking to us anymore, hardly even looking at us. Now we were really angry, yelling something not very nice back. Outside we took some stuff out of the backpack, then tied it together as small as possible and went back to the gate. I was carrying the now small backback and Flo was carrying Chan and a plastic bag. The guardian wanted to protest again, but Flo told him angrily that the 20l bag per person was applying to us as well and we walked through the gate. The guardian called into our backs, that we weren’t allowed to put the plastic bag back into our backpack once on site. The first few moments in Machu Pichu we couldn’t enjoy because of our frustration. But when we had climbed up to a point where we could overlook the whole scene our anger cooled off. Machu Pichu wasn’t showing its full beauty. Misteriously parts of the ruins were hidden behind mist and passing clouds. After a while observing this wonderous spectacle we started our hike up Wayna Pichu, the steep mountain at the far side towards the river valley. We enjoyed a beautiful hike with not too many tourists, the sun was burning mist and clouds away and the site started filling up with people, brought up the mountain bus load by bus load. What an amazing view we enjoyed from the top of Wayna Pichu. Not only were there more ruins, but we could oversee the whole site of Machu Pichu as well as getting a full panorama of snowcapped peaks in the distance. We left Machu Pichu arround noon, when most of the visitors arrived and crowded the place. The hike down to Aguas Calientes was pleasant but towards the end got quite painfull for our leg muscles not used to walk almost exclusvely steps for eight hours! Back in Cusco I could hardly walk anymore. Chan helped me getting around and said: “Mama, you are really, really old!” No wonder, my walking style was the one of a 90 year old woman! We had to stay four more days in our hostal, only then I was able to walk and bike almost normally again with not too much pain. 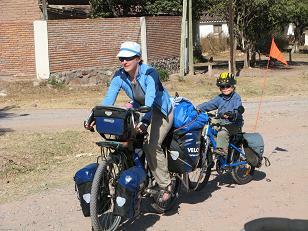 It was sunny and nice warm when we left Cusco with two more wheels than usual. 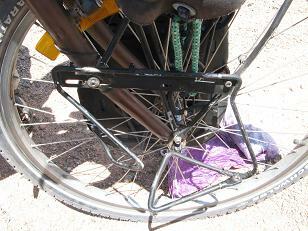 Attached to my bike with the follow-me tandem hitch is now Chan’s own bike. He had been asking for his own bike for a while now and we thought it would make a good birthday present. Our little guy is already 4 and ready to get onto his own two wheels! After the first few km pedaling himself, he exclamed that we could get rid of his trailer because he had his own bike now. Since then however, he has discovered that the trailer is still a good thing to have for napping, eating and playing and to be sheltered from wind, rain and hail! We got enough of that in the coming days climbing onto the altiplano and crossing this high plateau along lake Titicaca. On the first few days we could always escape the rain by arriving at a hospedaje mid afternoon, but the day we got over the last high pass for a while (4338m) we were caught in a terrible thunder storm. The night hadn’t been the most relaxing. We could stay in a centro de salud in a patient room. In there as well was a gaz stove with pots containing left overs. The beds we were advised not to use because sick people had been lying on them. 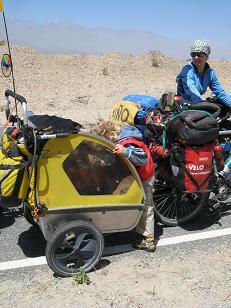 When Flo carried our panniers inside, he found the smell in the room quite unpleasant and looked arround for its cause. He came out with a plastic box, in it was a lambs skull, the dried flesh still sticking to it was reeking. The whole thing looked disgusting to us although Chan was quite interested in it. After a few minutes the doctor came looking for it and she carried the box under her arm as one would books. 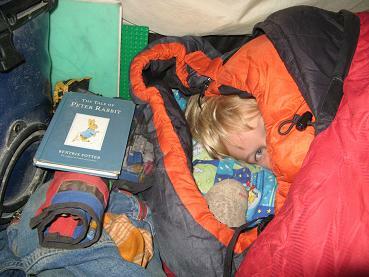 In the morning we had a flea in our tent, which we had put up inside the room to sleep in. Flo was up with the first rays of the sun and quickly we packed our bikes to get out of there. Breakfast we ate a few kilometers further in fresh air. By midday clouds were rolling in, not unusual for the season, but we wanted to continue riding for some 40km more, since it didn’t look too serious. But only maybe 10 minutes after we had left it started to rain very suddenly and with the rain lightening hit right next to us. It was too dangerous to step from the bikes to put on our rain gear. On the bikes we were safe from the lightening because of the rubber tires. I was terribly afraid. The rain had turned into hail now, whipping our faces hard. Our hands were hurting beeing freezing cold but the storm didn’t let us go. In fact, there were new storms approaching whenever we thought the worsed was over. The road was in some places covered with a 3-5cm thick layer of hail. Then there was an incredible loud thunder and at the same time I felt an electric shock passing through my left arm. Lightening stroke into the electric powerline paralleling the road and a branch of it had hit me. I screamed out horrified. Flo tried to calm me down but I was panicking and yelled at him to go faster. For about one hour we were caught in the terrible tempest then finally the hail turned back into rain and the time between lightening and thunders got longer. Then the rain subsided. There was a hut next to the road where “arroz con pollo” was sold. Flo went to ask for hot tea. We finally got jackets and rain gear out and tried to warm up our trembling bodies. We still had to go for another 15km to reach a town with hospedajes. The rain was getting stronger again and completely soaked we checked into a more expensive hotel because they had promised us hot water immediately. An hour later there was still no hot water. When we came back from dinner there was still no hot water. Only in the mornig the water was hot but by then we didn’ t need it anymore and we refused to pay the full prize of our room. We were riding long days. 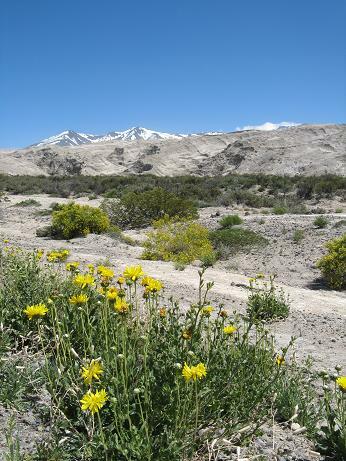 The altiplano was quite flat as its name suggests, and we were ready for a new country. We wanted to get into Bolivia after three not so easy months in Peru. Every mid afternoon we could observe different storms around us, somethimes getting caught by them, somethimes beeing able to escape. The winds were slowing us quite a bit coming from the sides or the front, never from the back. The landscape wasn’t as stunning as we had expected it from the description of other cyclists, but for the most part this must be due to the dull weather. On one of the worst paved roads so far, covered with holes and patches, busy with minibusses, big tourist busses, trucks and taxis whizzing by close, honking loudly, we got our first glimpse of marvelous lake Titicaca. This first sight was grandious. Passed Puno the road was much quieter and we were riding now directly on the shore of the highest navigatable lake. 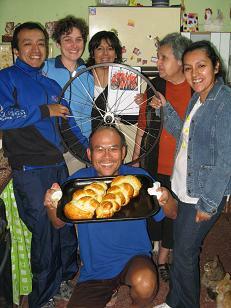 A day before we reached Copacabana in Bolivia, Sekiji, a japanese cyclist we had already met in Cusco, caught up to us. What we had been riding in six long days, he had done in three! That day we were riding together mostly and he was taking lots of pictures. The border crossing was very smooth and mid afternoon we entered into our 12th country since Canada or our 16th since Switzerland. Copacabana is a nice little town nestled in a small bay at the shore of lake Titicaca. It is growing only for tourists, a small copy of Cusco. We stayed three days to celebrate my birthday and visit Isla del Sol, the sacred birthplace of the Incas. Restaurants are popping up like mushrooms in Copacabana, but many of the owners can’t cook, but they have on their menu whatever a tourist heart desires like lasagne, pizza, risotto, etc. We ordered a salad and a lasagne. The salad was fine, not much that can be done wrong there. When the lasagne was served we couldn’t believe our eyes: It was a normal flat white plate, on it three sheets of pasta covered with maggi soup (chemical instant mix). Well we went to another restaurant for a second dinner. Chan had had a blast with a waiter in another place two days ago, so we went there and ordered a pizza and some desert to satisfy our still hungry stomachs while Chan took off with the waiter again “to work”. He was carrying dirty dishes to the kitchen, brining the menu to tables and finally the bill as well! As his first salary the waiter gave him a piece of lemon pie. It was now 150km to Bolivias biggest city La Paz. We rode it in two days. On the second day we rode through densely populated areas for about 20km before the centre. La Paz lies in a canyon spilling over its rim into El Alto because there is no more room in the canyon. It is filled with houses and houses. It was an incredible site, when we arrived at the rim and slowly rolled down into this sea of buildings, cars and people. We are staying in a “casa de cyclista” in a huge house with a beautiful garden. Sekiji had contacetd Linda and Roul and asked if we could stay with them as well. Now we are here with Sekiji and a brithish cycling couple. 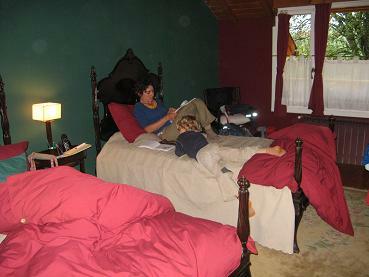 Linda and Roul have grand children and therefore a room full of toys in which we are staying – paradise for Chan! We will be staying for a few days, waiting for a packet with spare parts clearing customs. ” Flo, are we on the right road? I don’t want to ride back up this road to the City!”, I said. So we asked for the maybe 4th time, but again were reassured that this road would take us to Izcuchaca and further to Ayacucho. On our map were two roads eventually leading to Ayacucho, the next bigger city after Huancayo. We wanted to get onto the one on the right side of the river to get to Izcuchaca and into the mountains, and not follow a dry and hot river valley. Right now we were still on the left side of the river and the number of the road was wrong too. Finally we came to an intersection, where we could turn right into a village on our route as it was marked on our map. After some 3km the road made a wide loop and turned back into the direction we came from. Again we asked directions. Now we were sent back to the intersection. Slowly it dawned on us, that our map must be completely wrong. Later we found out, that the map showed a nonexisting road, the one we had to take was marked wrong and parts of it were missing altogether on the map. After a detour of about 10km we were back on track climbing one of the now regular “over 4000m” passes. The country was quite dry here and rocky, the dirt a bright orange. All land was used for agriculture to the top of the hills, sectional in small rectangles. And soon enough the road tipped to the other side and we glided passes villages and fields loosing what we’d just climbed switchback by switchback. We had wanted to stop at a restaurant for lunch, but there was none open and when we stopped to look for one inthe last town before Izcuchaca, kids came running at us screaming and laughing, so that we were quickly on the bikes again and didn’t stop anymore until we stood in front of the train station in Izcuchaca. We wanted to take the train from here to Huancavelica, some 70km further, for a change. We thought to stay in Izcuchaca for a night and catch the first train in the morning. But as we are in Peru and nothing is guaranteed, I went to the ticket office right away to inquire about schedules and prizes. It turned out that there was no train the next day, only that day at 4pm which was in 15 minutes. The ticket vendor also doubted that our bikes would fit onto the train. Normally peruvians aren’t complicated with luggage, it always works somehow. So I told him we were going to try anyway. We folded the trailer down to its shell size and packed its content into our backpacks. We unloaded the bikes and got ready for the train, watched closely by a group of kids. Finally the ticked vendor called the train and the conductor thought that there was enough space on the engine for our bikes. The ticked vendor still doubted it and let us know every minute or two. Then the train arrived, people and luggage got on and off. Flo brought our bikes to the engine and was able to tie them onto the very fron, while I was loading our panniers and packs onto the waggon and Chan was watching our stuff. The trailer came into our compartment as well and off we rolled. We had seen the tracks before, filled with dirt, overgrown with grass and not always very even. And that’s how it felt inside the train! We were swinging from one side to the other, but we desided not to worry and enjoy the ride instead. We were really hungry too and bought some sweet bread from a vending woman in the train. 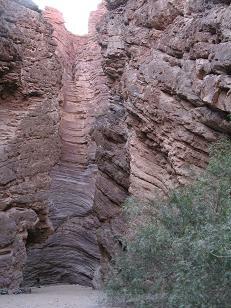 The tracks followed a river along a narrow canyon and slowly, slowly we gained in altitude. At every station more people entered with huge bunldes of luggage. The stations were always a chaos of busy people going here and there, women and children selling bread and other food and drinks, boys waiting with three wheeled carrier bikes to bring luggage to and from the train. Then the tunnels started. It was getting dark outside and every time we entered a tunnel it was pitch-dark in the waggon because there was no light. Now there wasn’t much to see outside anymore. Inside the train people were quarreling with the controller about ticket prizes, moving luggage around, eating and talking. At one station two women entered with tons of heavy bundles of herbs. They sat across the alley from us. The herbs smelled really nice, aparently they were to settle stomach gas. But slowly a strong garlic smell filled our waggon. Flo found out what it was, when he needed the toilet. The women had stocked bags and bags of peeled garlic into the tiny bathroom. We arrived in Huancavelica around 9pm. Now we had to get all our luggage out as well as a super tired Chan and our bikes from the engine. The train workers now suddenly wanted money for the bikes and when we had put the trailer back together, packed the bikes and were about to roll off, one of them stopped us, saying, that we hadn’t paid. Luckily I still had the tickets and the controller could convince him, that we had also paid for the bikes. We found a hotel quickly and went out to get some food. it was a late night and we decided to sleep in the next morning and stay and extra day to rest. On the gravel road out of Huancavelica dogs came chasing us from every second house. The morning had started difficult with Chan wanting everything different making me really mad. When we left the hotel we had had spectators once more, trying to touch Chan in his trailer and now those stupid and dangerous dogs again! I was in a really bad mood. But a few kilometers passed the town the landscape was so beautiful and the road wasn’t bad at all that my mood changed quickly and we enjoyed the ride. Soon we saw lots of llamas and alpacas. The rocks looked alomst unreal with such bright orange and red colours. There was supposed to be a village at the altitude of 4170m, but it was abandoned. We ate bread, olives and cheese in front of a ruinous adobe house. Now the wind picked up and I started to feel the altitude with some slight dizzyness. But further up we followed the road onto one of the highest altiplanos in Southamerica over 4400m. Suddelny a herd of llamas came galloping down the road. They slowed down in front of us, then passed one by one. Flo got water from a stream and then we looked out for a place to camp. There were no bushes or trees, just pampa. So we hid our tent behind a small hill next to the road. In the morning a herd of sheeps wlaked passed, then kids played next to our tent. A bit later a woman came by calling something in quechua and a bit later she came back with some sheeps. We might as well have put the tent right next to the road, the whole valley probably knew, that we were there. The road led towards a red mountain which was even brighter in the sunlight. And still we were riding uphill. New peaks turned up at the horizon the higher we got and the rocks showed ever new colours as if dipped in a rainbow bath. 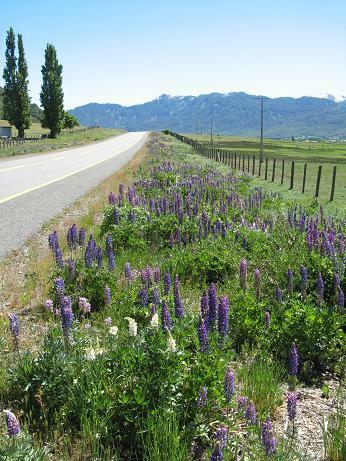 Many times we had to stop and just enjoy hte sight of these mountains! And still the road was leading up and up. Soon we must have been able to touch the sky! The pass was on 4853m. Rainclouds rolled in from one side, but to the other we had a beautiful view onto lakes, rocks and mountain chains. The clouds urged us to leave the pass. Along the lakes was the home of a type of marmot which stole the rabbits ears and painted them orange, his tail it got from the squirrel, but the tip it must have burnt or why else would it be black as coal? It was quick that little creature and we couldn’t catch it on film. That night we spent in Santa Ines at over 4600m. Our hostal didn’t have any water, not even a bucket to flush the toilet. Florian asked for wter, but the boy said:” we don’t have any for ourselves.” “But there is the river and the lake right here!”, said Flo. The boy shrugged his shoulders and said:” The river is contaminated because of the mine and the lake is dead.” ” But where do you get your water from?”, I asked. “We have to fetch it from far.”, the boy said. The village didn’t have water for two weeks now because their normal source dried out. the government would do something, the boy had told us, maybe in two to three weeks they would have water again he exclaimed. Some 20 bumpy kilometers brought us onto pavement again. Another pass, another downhill and we climbed again onthe way to our second highest pass. It was a long climb and it was getting late. In the next village we asked for a hospedaje but instead could spend teh night at a cruz roja centro de salud station (a kind of mini hospital) in the only patient room. This was really nice of the doctor, but the kids of the village were annoying, wtching us close while we were cooking outside and tehn starring through the window while we ate and prepared our beds. The tiny hodpital didn’t have electricity just a generator for emergenies. The toilet was out of order, there was a shithole in the back yard. A car batterie was sitting on a chair in the bathroom with cables going into the adjacent room. It must have been at least 100 switchbacks which slowly brought us up to an altitude of 4750m again. At the top a truck was waiting for us. Some women and kids came our way and Flo said:” Not even up here we are left alone!” So we took a “Taking pictures-throwing sand into the wind-eating crackers- beeing watched -break” and then whizzed down, down, down passed rainbow mountains, rocks and yellow grass. It was about 50km downhill, back to 1900m and back to quite warm temperatures. 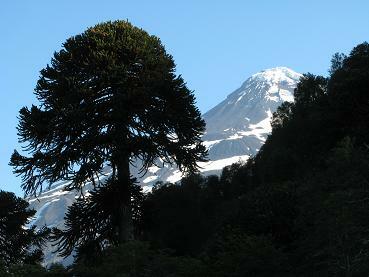 On the way down the llamas were replaced by cows, horses and donkeys, the bare pampa with eukalyptus and pine forests. At the very bottom of the valley we stopped our riding day and had a cup of coffee before moving into our “cuarto”. The used bed linens were taken out of the room hold under water for a few minutes hung into the sun and given back to us. Flo was clearing the room from garbage before we carried our stuff upstairs. 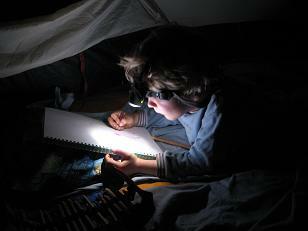 We prefered to sleep in our own sleeping bags in our tent inside the room that night. Another 27km brought us up the last pass before Ayacucho. this one wasn’t quite a high, just 3900m. early afternoon we arrived in Ayacucho on the other side. Before us was a part of the way which promised to be exertive. A few more 4000m passes parted by deep hot and tropical valleys. This road was not paved. 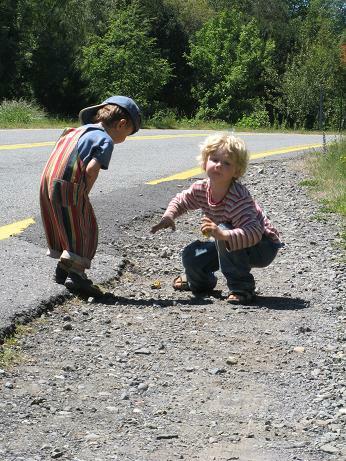 Friends of ours sent us information about the condition of the road: A lot of riverbed like parts, they had to walk a lot. We had one month left in Peru. It would have taken us at least two weeks for those 380km of gravel. Two weeks which I wouldn’t have enjoyed nor would Chan have been happy with another bumpy ride. We decided to take the bus, that would save us an exhaustive two weeks as well as the money for an extention of our visas. We checked out a few bus companies, but there was only one doing this difficult road. We bought seats in the very front above the driver to enjoy the panoramic view. 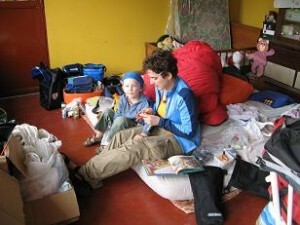 The night before our departure we packed everything from the trailer into the backpacks. At 6am we rolled through the city to the bus terminal and there folded the trailer to its shell size. When the bus arrived, Flo loaded the bikes and our luggage, while Chan and I watched our stuff. the first surprise was, when we got to our seats, which were not the panoramic ones, but one row behind. We couldn’t change that now anymore. But on the panoramic seats were two other tourists which switched seats with us after half the time. The first part of the way, to Andahuylas, took us ten hours. At lunch time we stopped at a restaurant. I stayed in the bus to cut some apples for Chan, while Flo and Chan went for a pee. When I wanted to join them outside, the door of the bus was locked. Nobody had told us, theat we could’t get in and out of the bus during the 40min break. So I was locked in, the driver had disappeard. We arrived in Andahuaylas at 5pm. There we had to change the bus for another ride at seven, supposedly taking three hours. While we waited for the new bus I got some food: rice with fried onions. it started to rain and we had to move our stuff under shelter. Finally the bus had arrived. Flo went to load the bikes and trailer, but they said there was no space. Flo said:” Well, if there is no space down here, I will take our stuff up to the seats. We bought our tickets in Ayacucho through to Abancay, we paid extra for our luggage and we will take this bus with all our luggage. As you know there is no bus tomorrow because of the census.” Suddenly there was space for the bikes but to make it a bit more complicated, Flo had to take off the front wheels and one of our backpacks was loaded onto the other side of the bus. A nice surprice waited for us in the bus: Shortly before departure we were served a hot seet infusion and a pastry. It was already dark when we rolled out of Andahuaylas. The bus was really slow and now and then stopped for a few minues without any reason. Chan fell asleep on my lap. After maybe four hours I started to get restless. Why were we advancing so slowly? Finally we could see the lights of Abancay far down in the valley. But the descent was a torture. We went from one side of the mountain all the way to the other, turned around and came all the way back without loosing much altitude. halfway down we stopped again and bus personel switched buses with one coming the other direction. Other busses from other companies overtook us. Why could they drive so much faster? We finally arrived in Abancay at 1am instead of 10pm. now we had to put the bikes and the trailer back together. Chan of course woke up and cling to me util the trailer was ready. in there he felt save again and started playing. At 1.30am we started looking for a hotel. At that time most were closed of course. Finally we found one open. it was a really dusty, grubby room but we had no choice. The owner was really nice and helped us carry the bikes and trailer upstairs. It was passed 2am when we finally closed our eyes. Now we were looking foreward to Cusco. Three days of riding, maybe four and we would see our Swiss cycling friends (www.affenbrunner.ch) and Steven the Australian again. We would take some days of rest, clean our bikes and visit Machu Pichu. 36km uphill, a climb of 1500m took us out of Abancay. on the pass we could still see down onto the city. It started to hail and rain so that we quickly put on our raingear for the downhill ride, another 36km to Curahuazi back on 2680m. Flo got diharrea during the night, but he wanted to ride the next day. Cusco was waiting! Down we whizzed, the bridge over the river was at 1900m and from there the road followed the river uphill again along a super hot valley. Flo and I both struggled. I had a hard time with the heat as usual and Flo just felt very weak. Finally he had to sit down in the shade and I stopped the next pick up car. These lovely people gave us a ride to the next town, where we got a room in a hostal. Flo went to bed with a high fever. That evening a couple from Austria arrived on a tandem. Chan and I talked with them late into the night. In the morning, Flo’s fever was gone and he wanted to ride although it was uphill for another 25km to the next pass. Only at 10am we started riding after we had said goodbye to the tandem couple who was taking the route we came from under their wheels. Slowly we gained in altitude. By 3pm we had made it to the pass. Snow peaks framed the horizon, it ws beautiful up here, much more our climate! But both Flo and I didn’t fell well now. The pass on this side wasn’t as steep and the road wasn’t taking us below 3300m anymore. Almost in the village we wanted to spend the night, there was construction work on the road. A huge ditch stopped our ride. The cars took a 4km detour on gravel. But while we were standing there, trying to decde what to do, some constraction workers came and showed us a way over two smaller ditches in the adjacent fields to get around the street work. 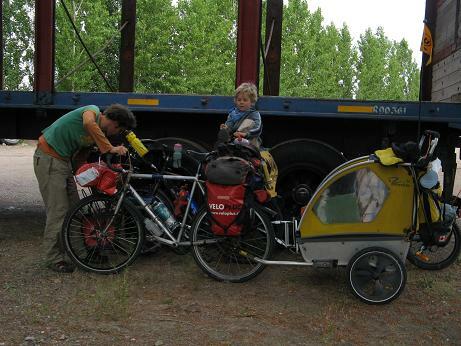 They even helped us lift the trailer and the bikes over. No no more obstacles were in our way, even the rain clouds passed around us, leaving us dry. That night Flo and I both got a soar throat. Cusco was now only 26km away with not much ups and downs on our route. 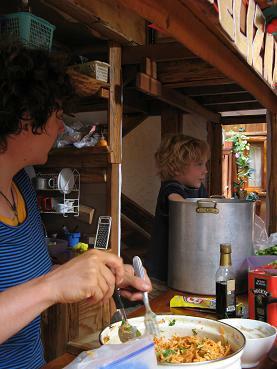 We arrived at the hostal around noon and went to eat lunch. When we came back, Flo went to bed with a high fever again. The next three days his fever wasn’t coming down. Finally we went to see a doctor, who of course gave him antibiotics for an airpipe infection. The Swiss Rahel and Joerg and the Australian Steven stayed a day longer to help me out. They looked after Chan, while I looked after Flo and got some rest myself. The day they left, Chan got a fever. When Chan was just recovering from his flu or whatever it was that made him have a fever for six days, I started having a fever and I was in bed for a week as well. This hasn’t been exactly our idea of our visit to Cusco, the ancient Inca capital. We are here now for over two weeks and haven’t seen much else than our room, the hostal, the internet cafe and the market to get fresh fruit. The plan is now to visit Machu Pichu, come back to Cusco and get the bikes ready for the last leg of our trip in Peru, across the altiplano.